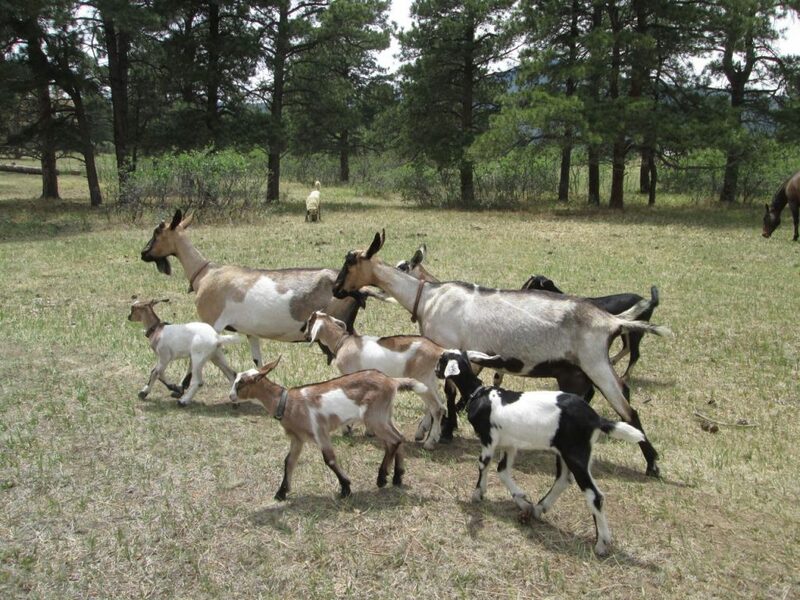 Goat-O-Rama | Put some color in your herd! Phil and I had really a special day with our goats after we left Charles and Dominique’s house. 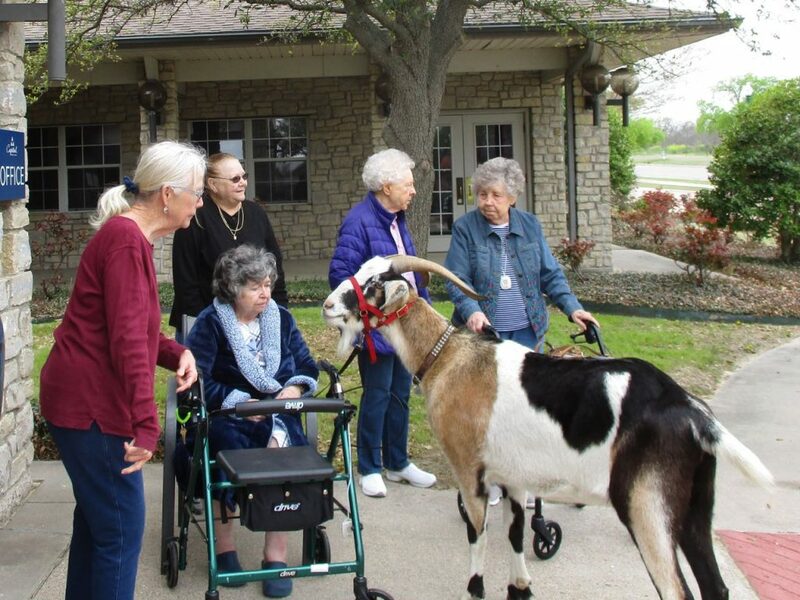 My aunt Jana asked if we would be able to visit her mother at an assisted living home only half an hour from Granbury. 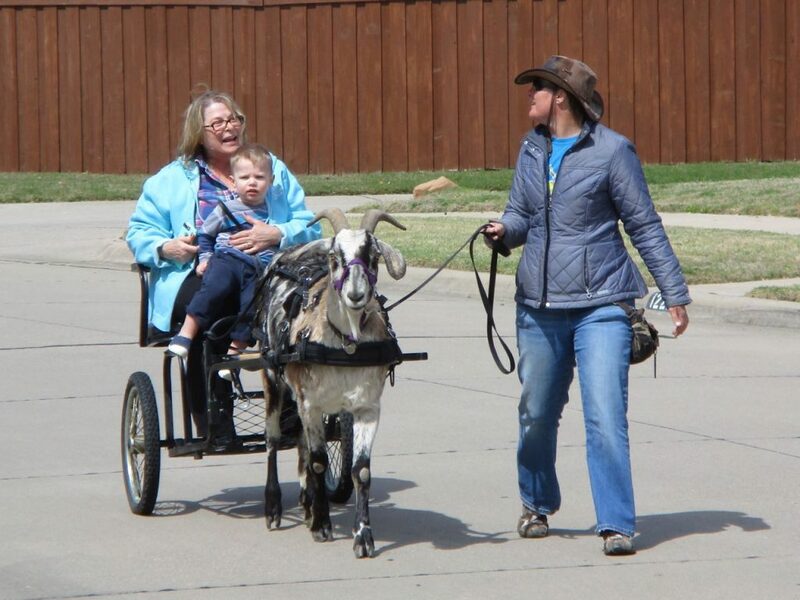 Our schedule was open, so Jana and her sister organized our visit with the home’s activities coordinator, and despite the chilly weather, every resident came out to meet Finn and Sputnik and take a ride in the goat cart! Unfortunately, all of our names got lost in translation and the advertisement printed up by the activities coordinator came out rather hilarious. 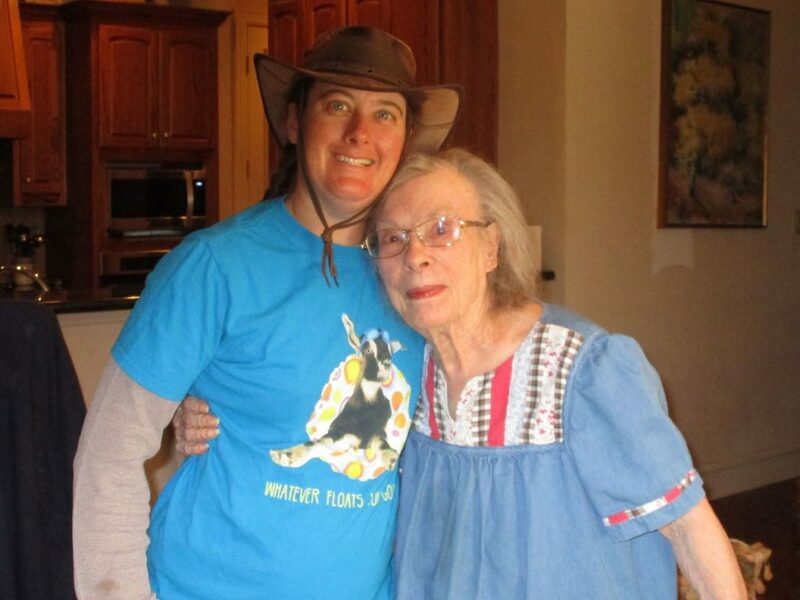 This is my aunt Jana with her mother, Peggy. 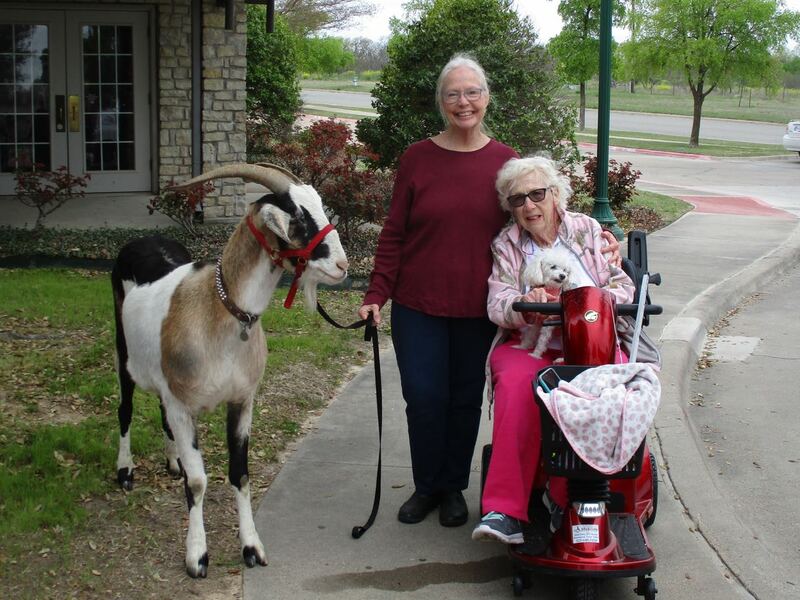 Peggy had goats her whole life growing up and adored them, which was what inspired Jana to ask if we could bring Finn and Sputnik to visit her. 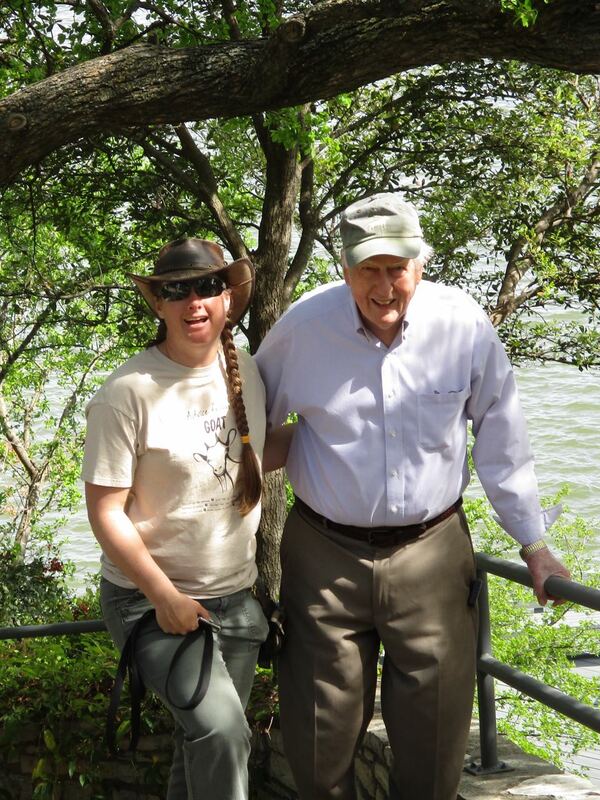 This wonderful gentleman (I think his name was Jerry) may have had the most fun of anybody. 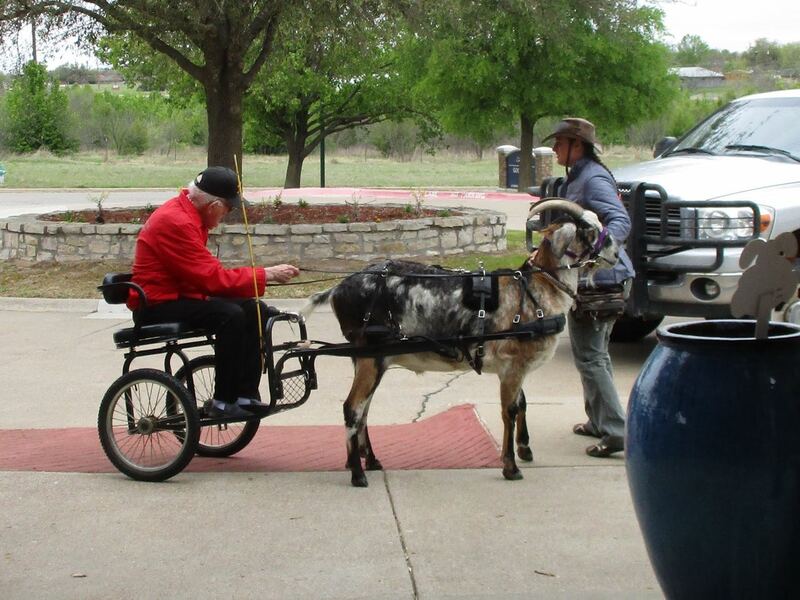 He was the first to volunteer for a ride, and he honked the horn all the way around the circle. He had a hard time talking, but he had absolutely no difficulty smiling! Mary was a little bit sneaky. She was one of the first to ride after Jerry, but after a few more people went, she got back in line and pretended she hadn’t already ridden. Someone made the excuse that her memory was starting to fail, but I saw the crafty gleam in her eye. She knew exactly what she was doing and no one was going to tell her she’d already taken a turn! We weren’t going to argue with her. Peggy finally got her ride. 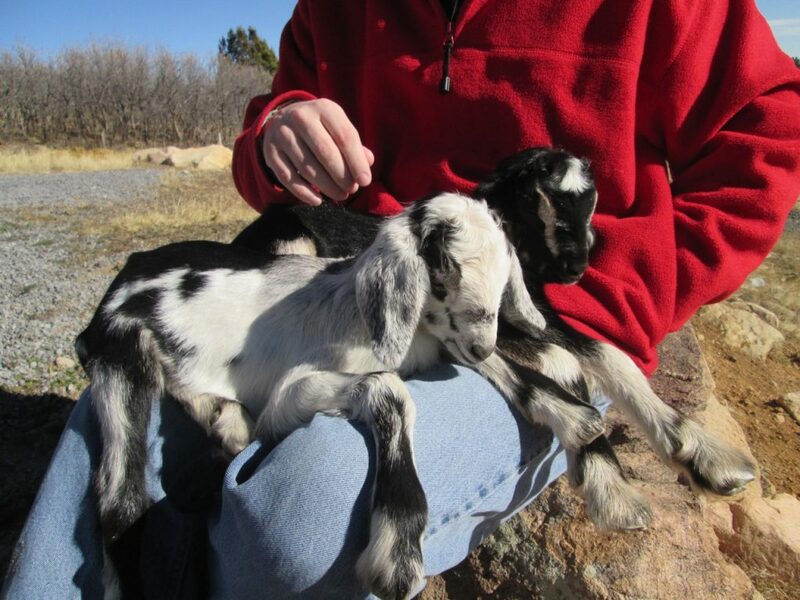 She’d raised Spanish and Cashmere goats, so she had never seen any as big as Finn and Sputnik. 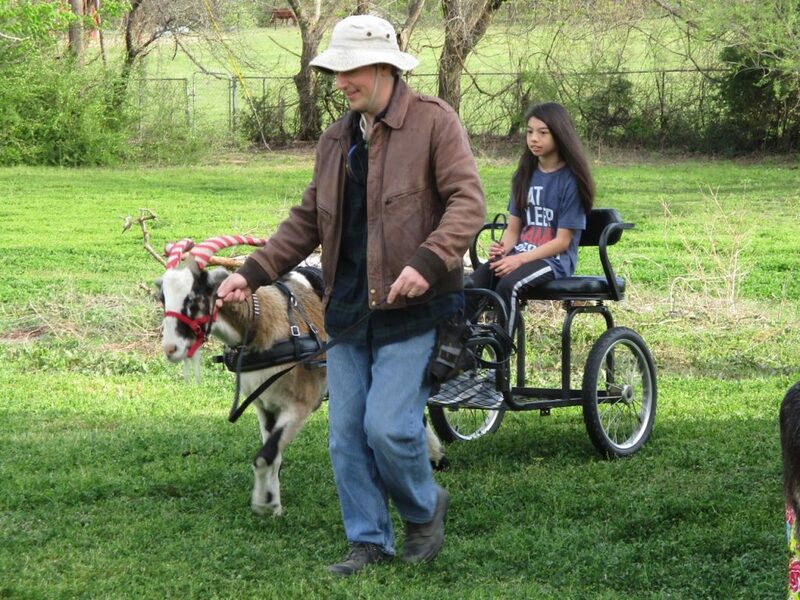 She was thrilled to have her first ride in a goat cart! Aileen (in the blue bath robe sitting down) spent a good bit of time holding onto Finn while Phil played his fiddle. Finn was a very good boy and let everyone pet and admire him. What a wonderful day! I would do this again any time. 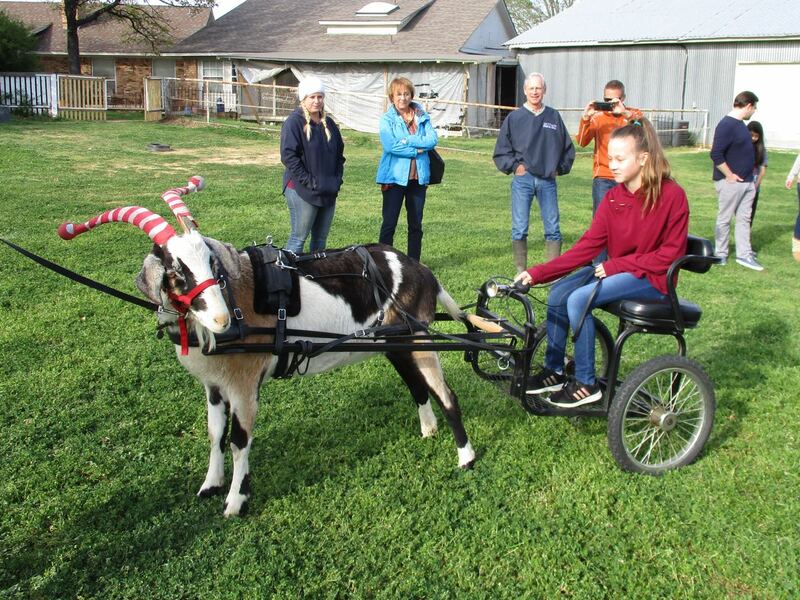 It brought so much joy to these wonderful folks who are now mostly housebound and no longer get to be around animals. I love how Finn towers over all these people, yet he’s got such a calm, gentle presence. 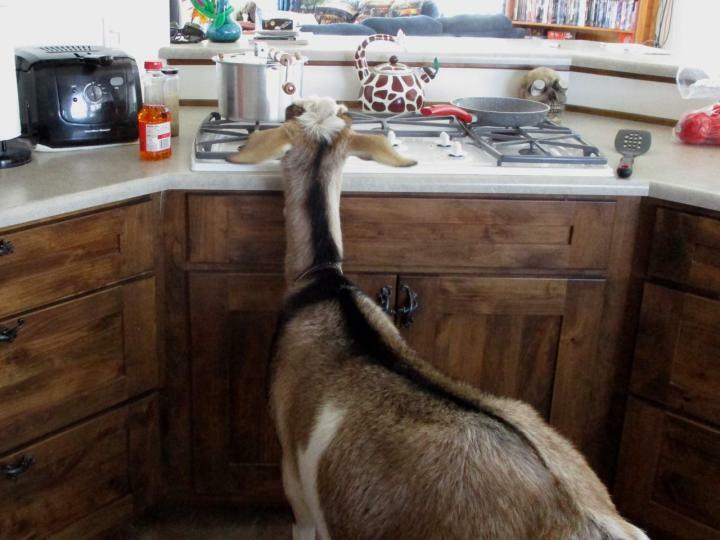 Jana had never really stared into a goat’s eyes before, let alone had one who stared back. And Finn just loves gazing into people’s eyes. 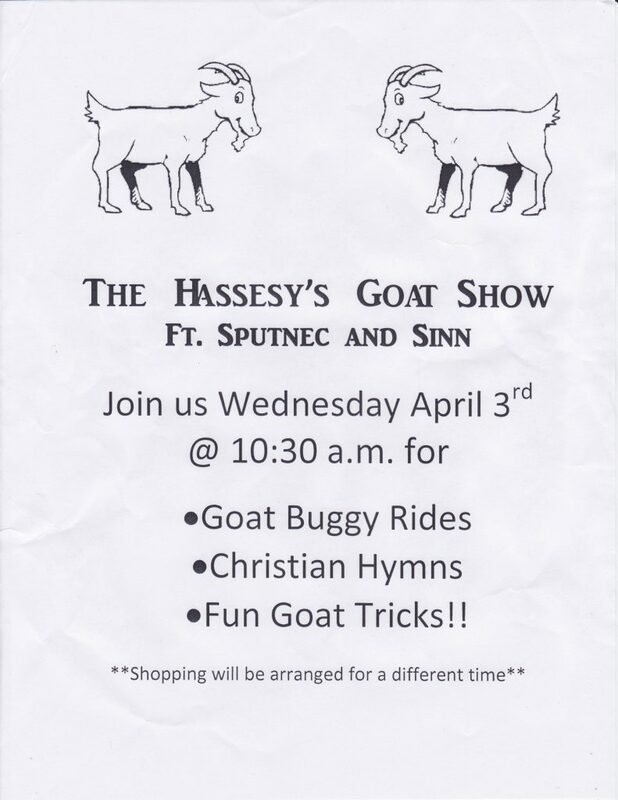 The “Christian Hymns” advertised on the flyer turned out to be “Be Thou My Vision” (which is the one hymn Phil had music for) and a lot of traditional Scottish and Irish fiddle tunes. 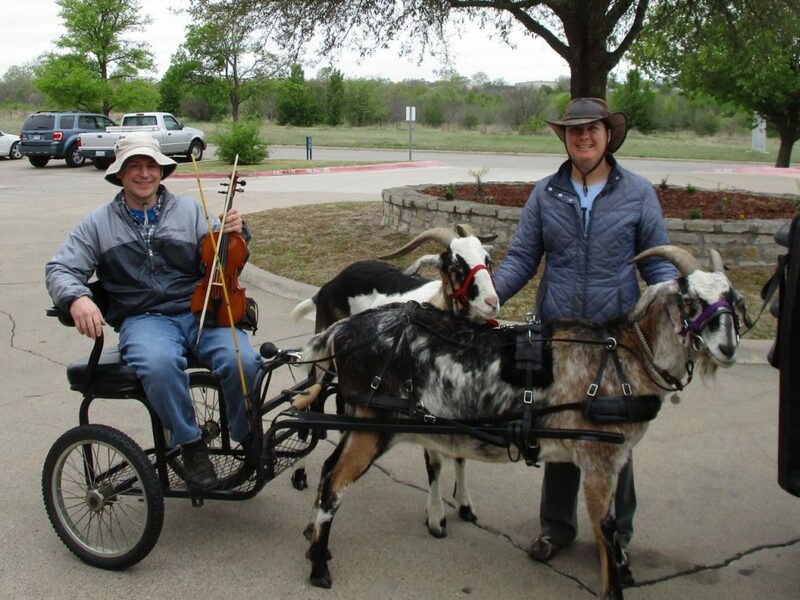 Everyone loved the music as much as they loved visiting the goats. Sputnik and Finn were both such good boys through all of this! Finn was patient, calm, and kind around all those frail old people with their scary walkers, canes, and wheelchairs. It was the first time our boys had experienced something like this and they were very well-behaved. 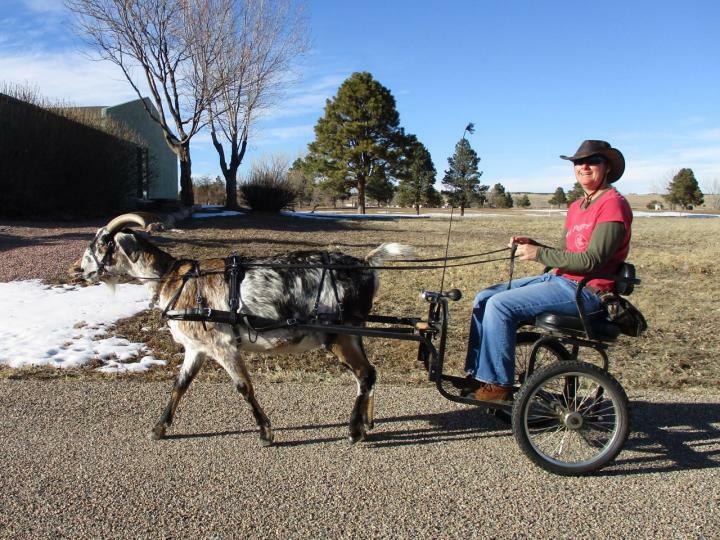 Sputnik enjoyed pulling his cart. Every resident took a ride. 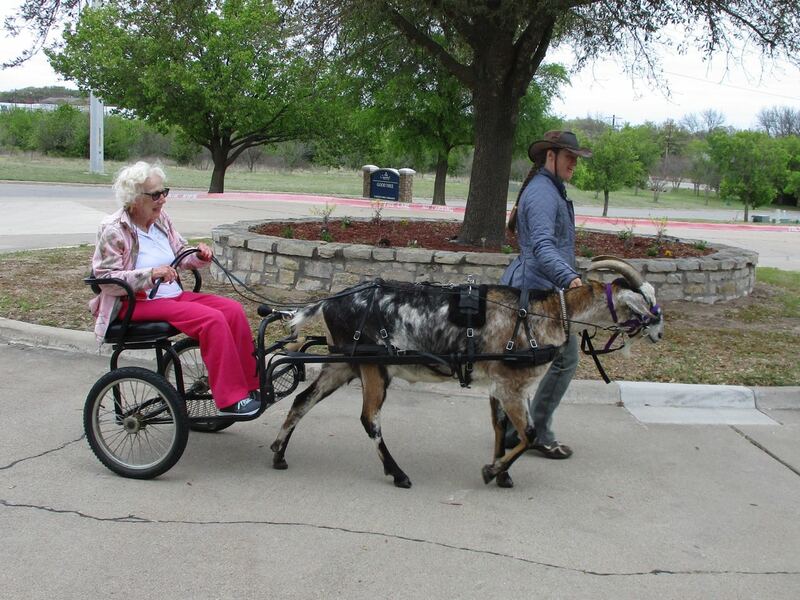 One woman name Sue could not speak or walk at all, but she nodded when they asked if she wanted a ride. Three nurses had to lift her from her wheelchair and into the cart. Sputnik was nervous at having so many people crowding around his cart all at once, and he wasn’t sure if he should stand still when the cart bumped and rolled as Sue got situated. 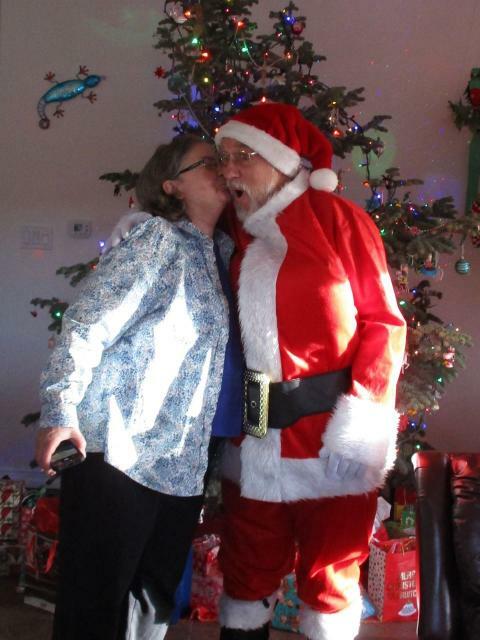 He jumped when the nurses hastily flung a blanket over Sue, but I calmed him with cookies, and once we got underway he was fine again. Sputnik got a big kiss afterwards for all his hard work! 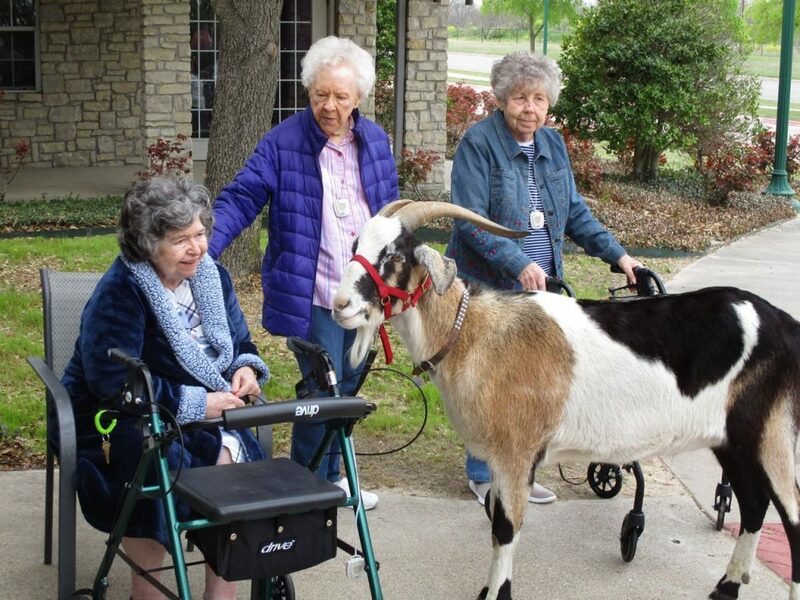 After our visit to the nursing home, Jana took Phil and I out with her mother Peggy to a local BBQ joint called “The Purple Goat”. The food was amazing! 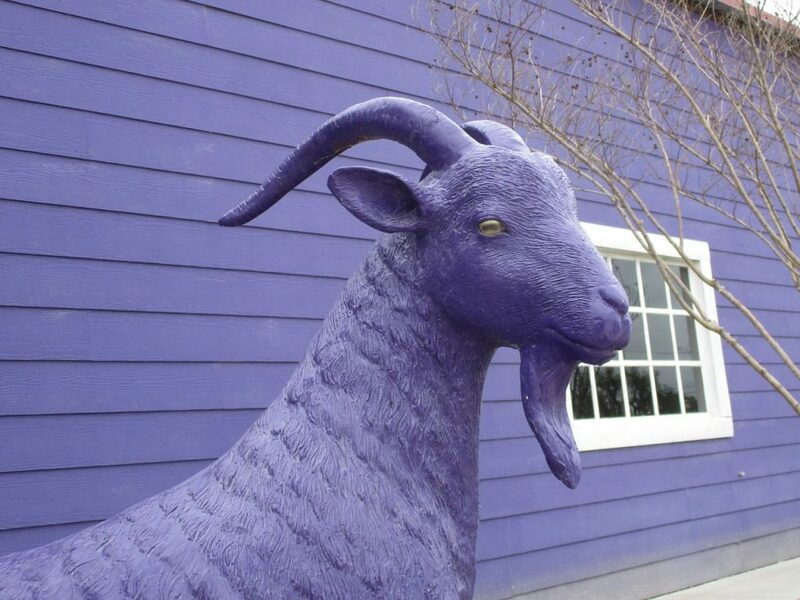 And they had a life-sized purple goat out front. 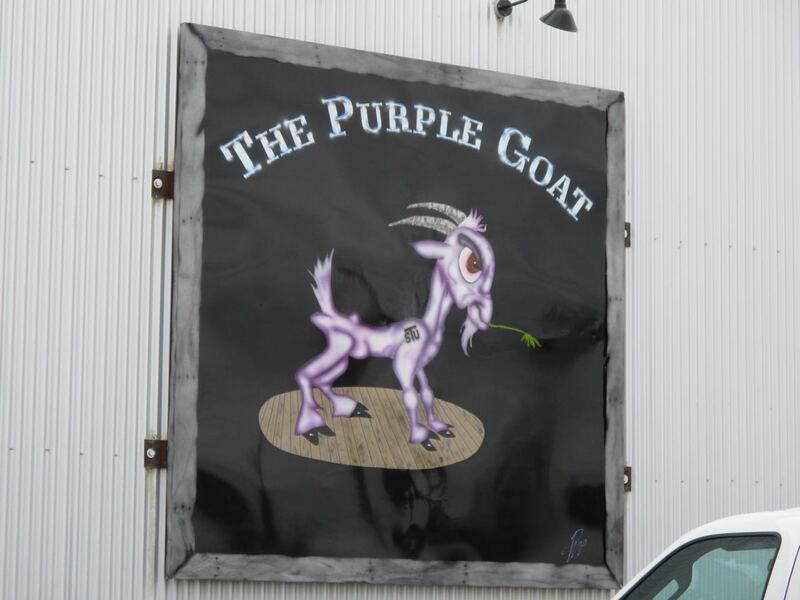 The purple goat had very authentic goat eyes and the perfect little goat smile! 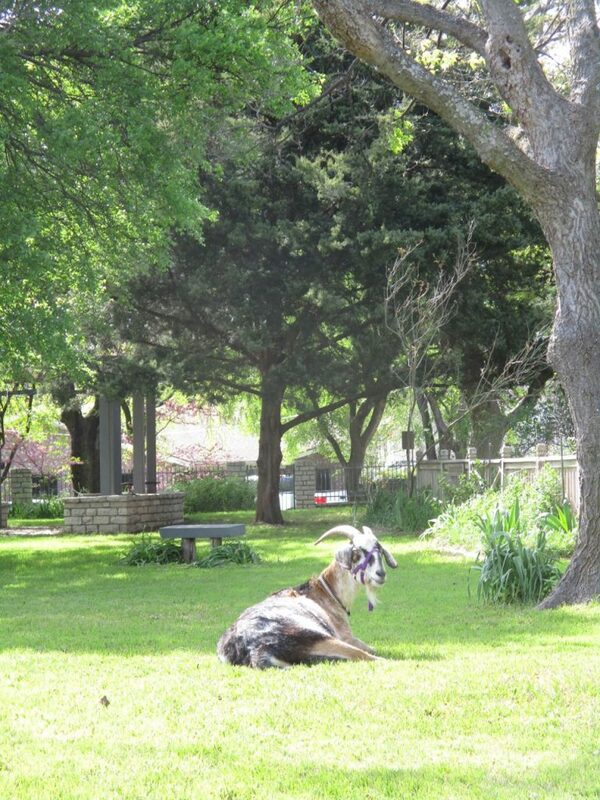 After lunch we said our farewells and struck out for Crockett, TX to embark on our “Lone Star Hoofenanny” adventures. 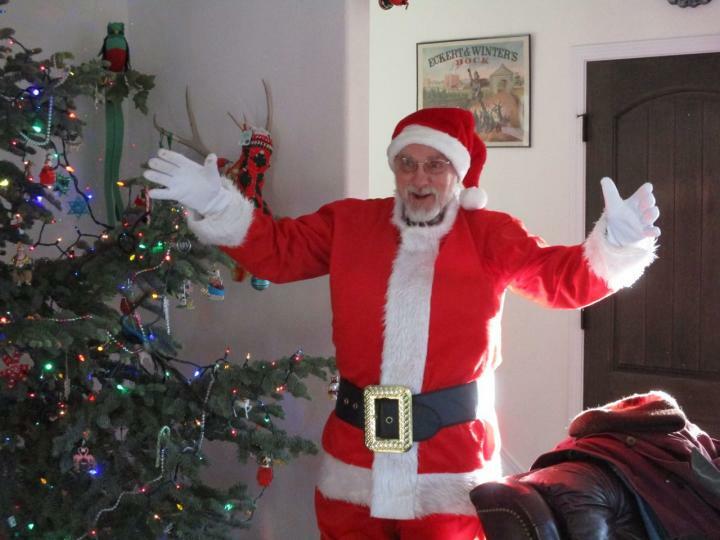 We stayed that night at the Warfield Bed & Breakfast which was located right next-door to a funeral home. Since no one was having a funeral that night, there was plenty of room to park our trailer. 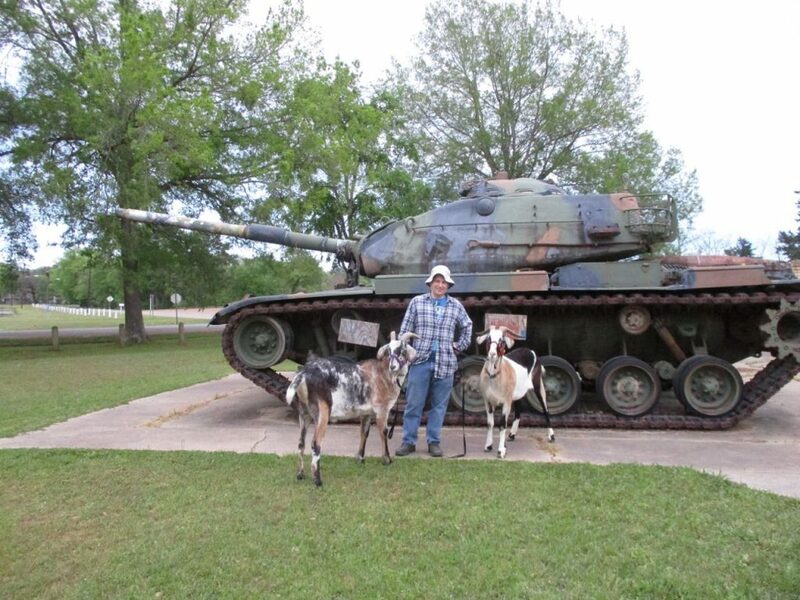 We took the goats for a walk around the back streets of Crockett and came across this army tank sitting near a park! Phil really likes to pose with army tanks. After we left Jana and Peyton’s, we traveled down to Granbury where we visited my grandfather Charles and his wife Dominique. 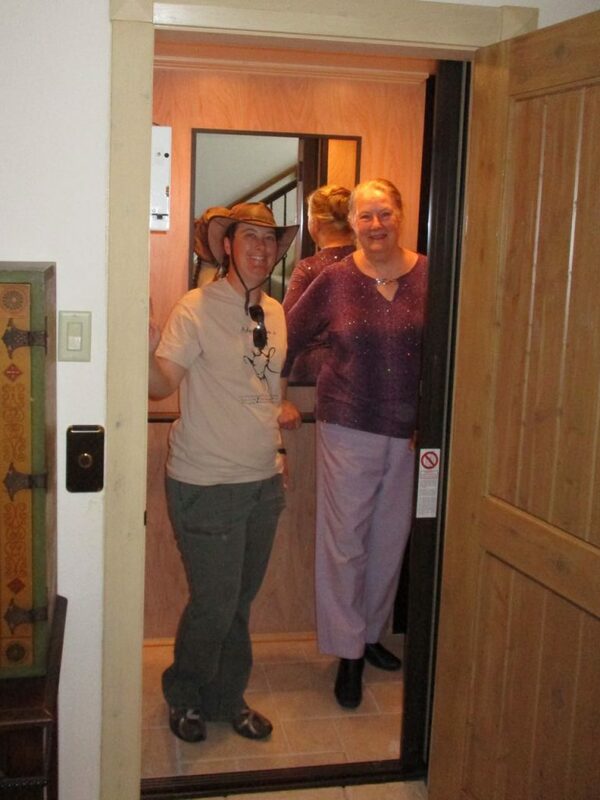 They recently installed a small elevator in their house and we got to ride in it. 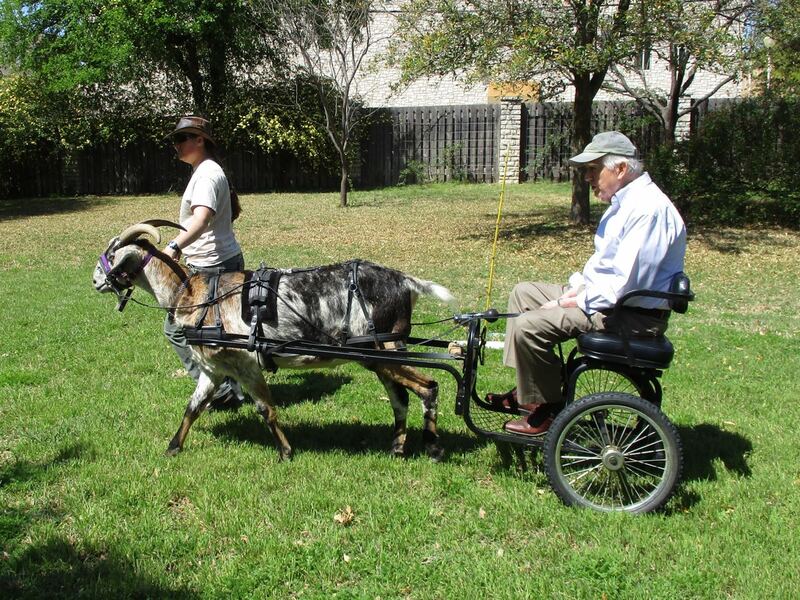 I was told I needed to get a goat to ride in it too, but even if Charles and Dominique had allowed it, I don’t think either one of our goats would’ve fit! Sputnik took Dominique for a spin around her big, beautiful yard. Dominique looks so dignified. 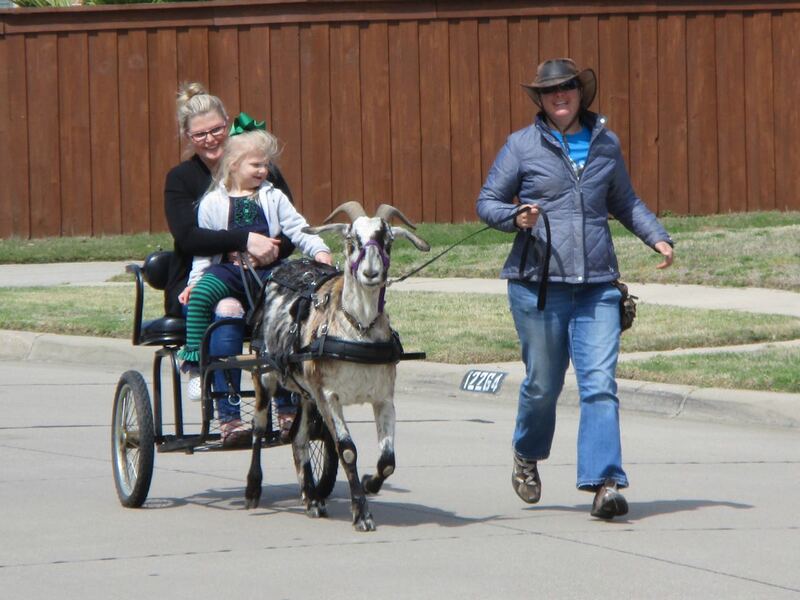 I think she was born to ride a goat cart! 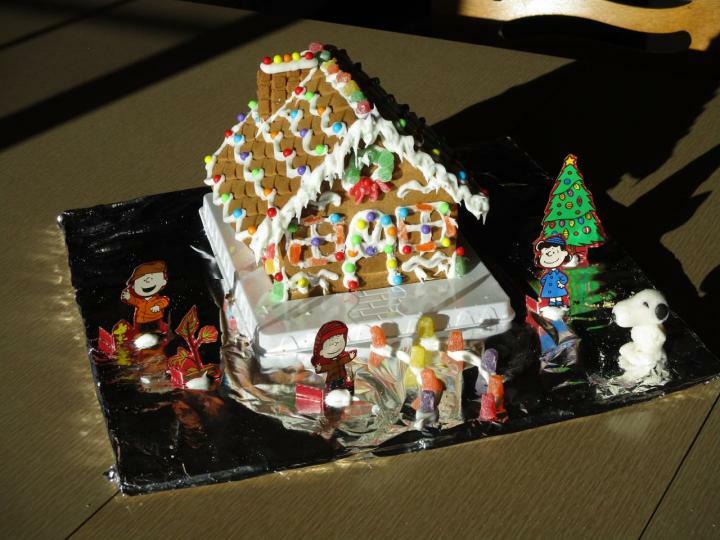 Charles was less dignified, probably because we had to bribe, threaten, and coax him to give it a try. We finally convinced him to take a short spin. 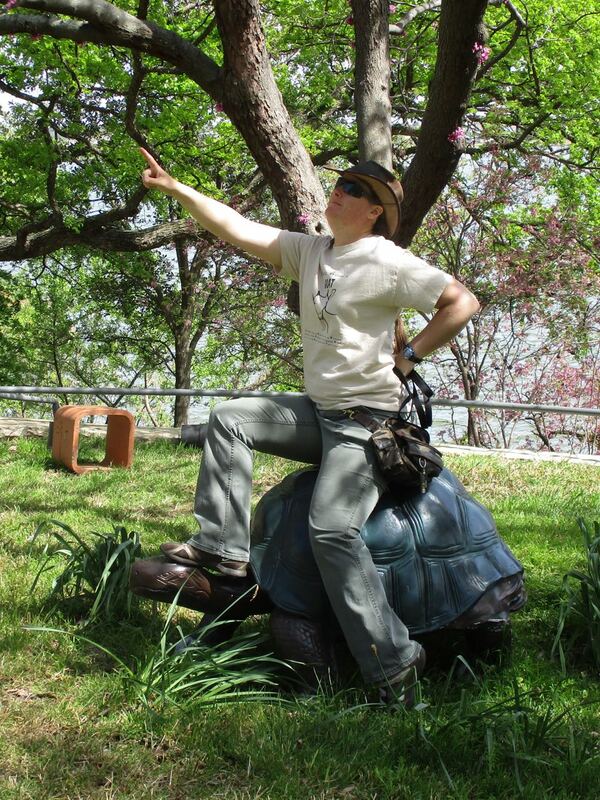 Not only were the goats supposed to ride the elevator, I was also told that we must have one of them pose on top of this big tortoise. Charles objected on the grounds that the goats’ hooves might damage the paint or dent the metal. 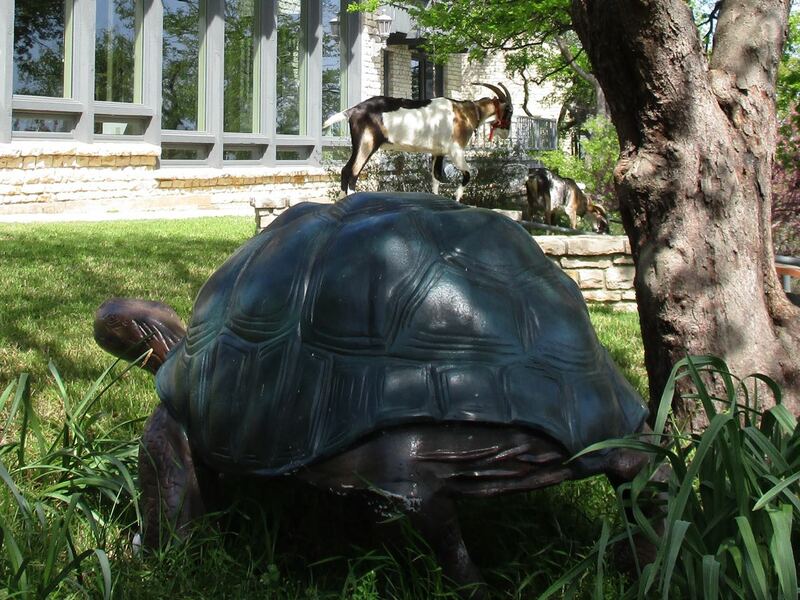 So the goats stayed off the tortoise and Phil faked a shot of miniature Finn standing on giant shell. Then I rode the tortoise! After that we went for a walk around the property. 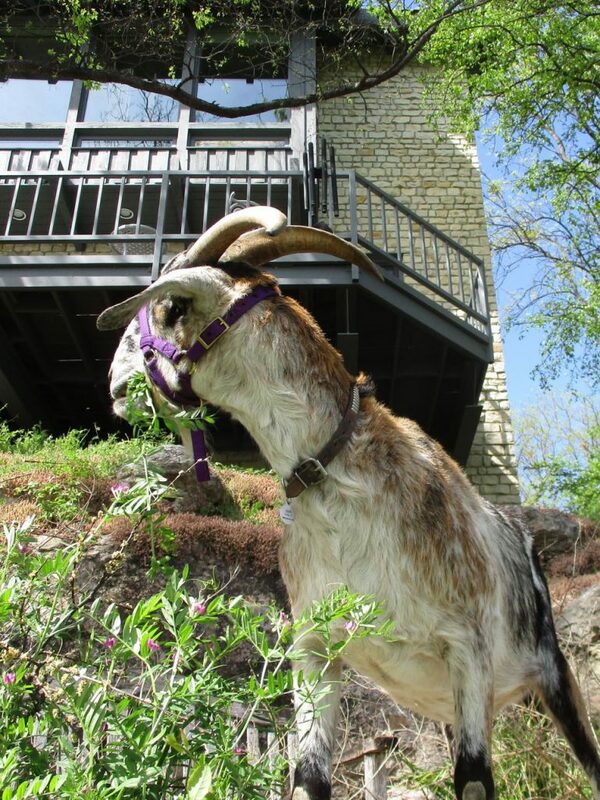 In addition to the huge, beautiful lawn and gardens up top, Charles has a series of stone walkways going down to the lake. 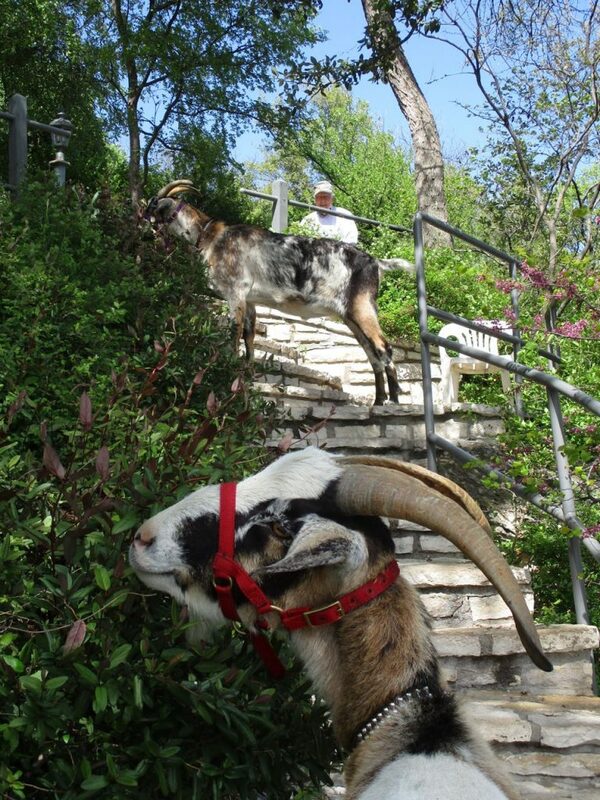 Finn and Sputnik love stone stairs, and Charles had no end of amusement watching them climb up and down, nibbling the variety of tasty overgrowth as they went. Charles has several nice benches placed at strategic points along the pathway for both taking a rest and taking the view. This overgrown patch of vetch was a particular favorite for the goats, and Charles loved watching them devour it. We continued on to the boathouse where Finn made a thorough exploration of the dock. 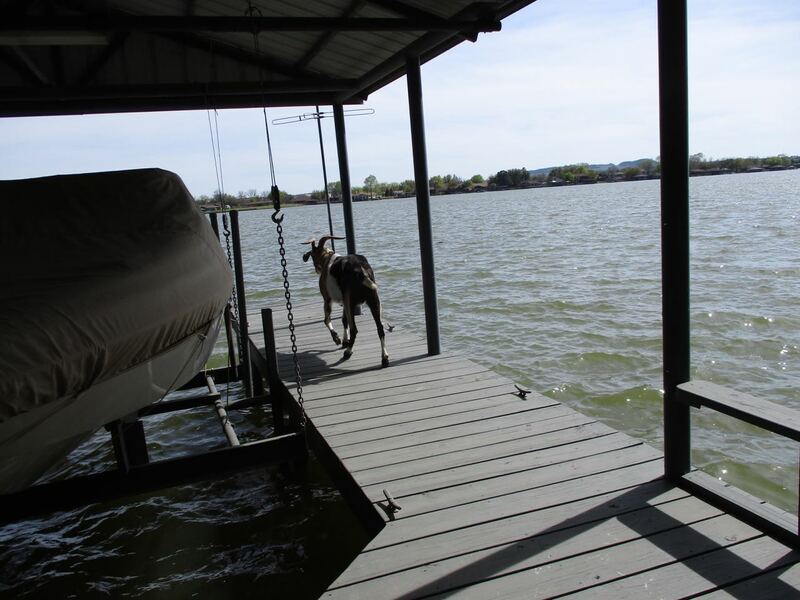 Sputnik wasn’t so sure about getting too close to the edge near all that water. Back to the top. Good boys! I have always loved Finn’s intelligent, adoring eyes. He loves all things “people” and he looks for ways to engage. Sputnik, on the other hand, just wants to find more delicious things to eat! We spent the rest of the afternoon lazing around in the sunshine on the grass, drinking in the sights and smells and sounds of Charles’ peaceful yard. 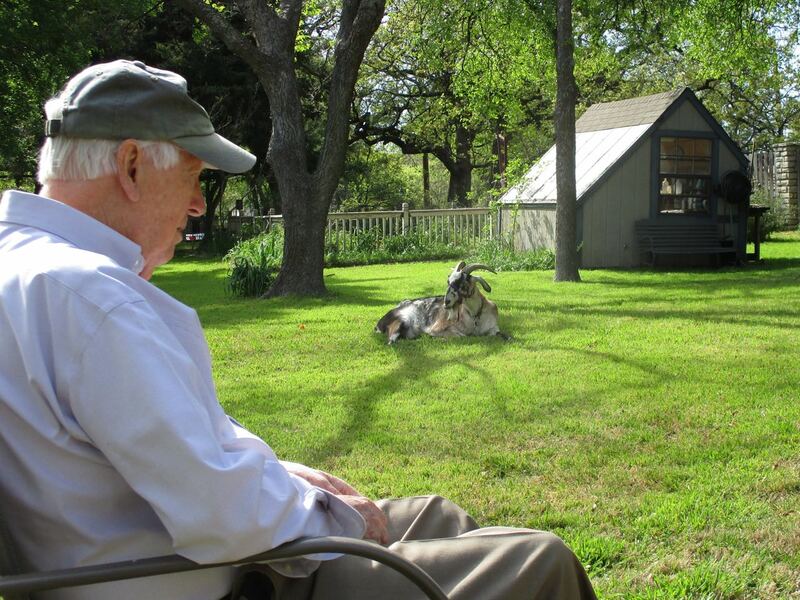 It was a beautiful afternoon, and I just love Texas in the springtime. 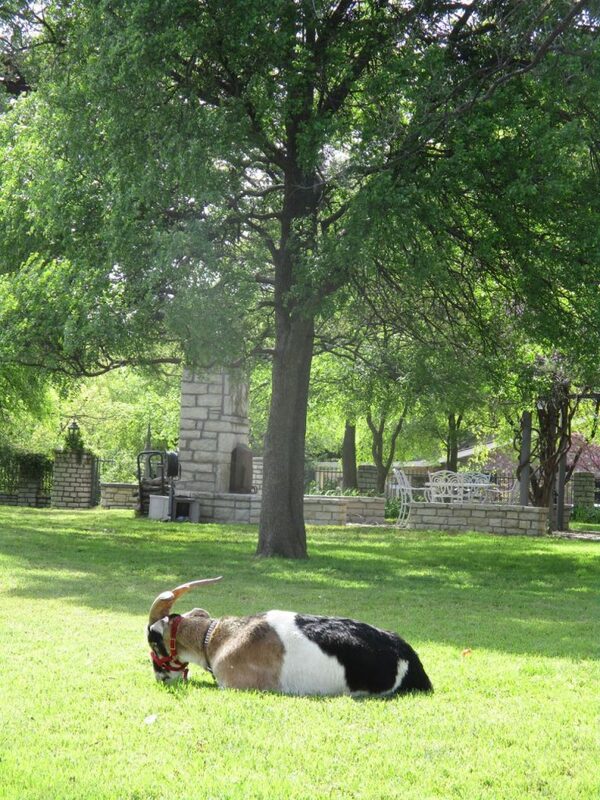 Our stately goats look very content on this stately lawn, don’t they. I expected them to look out-of-place, but on the contrary they appear to fit right in. 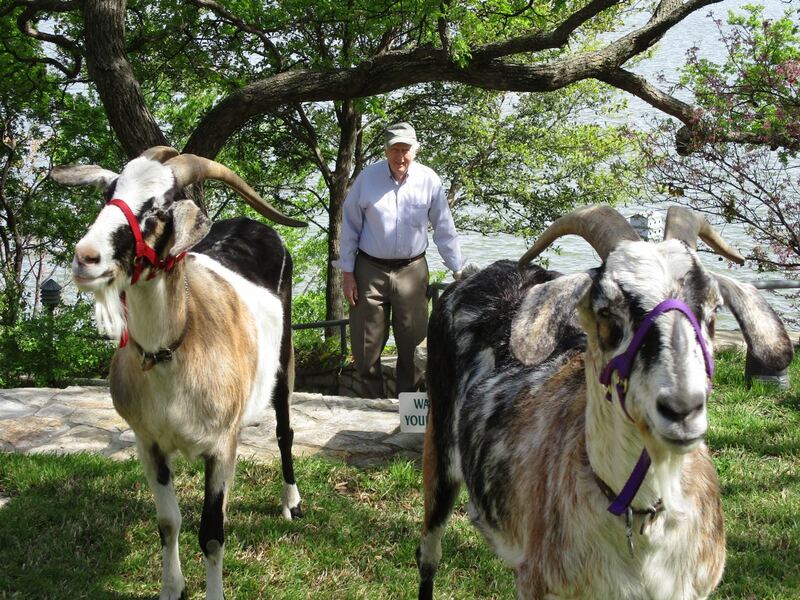 Goat-O-Rama in the Lone Star State! 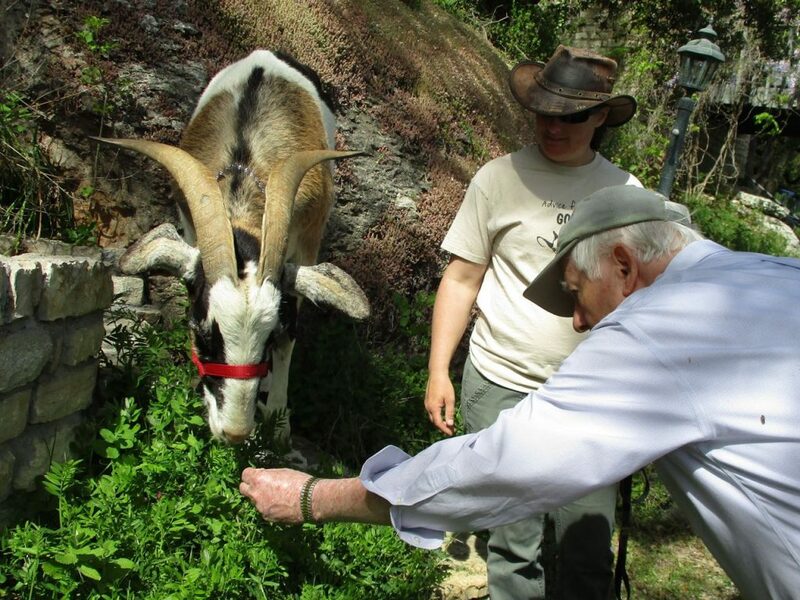 Phil and I usually take a spring vacation, but never before has it involved goats! 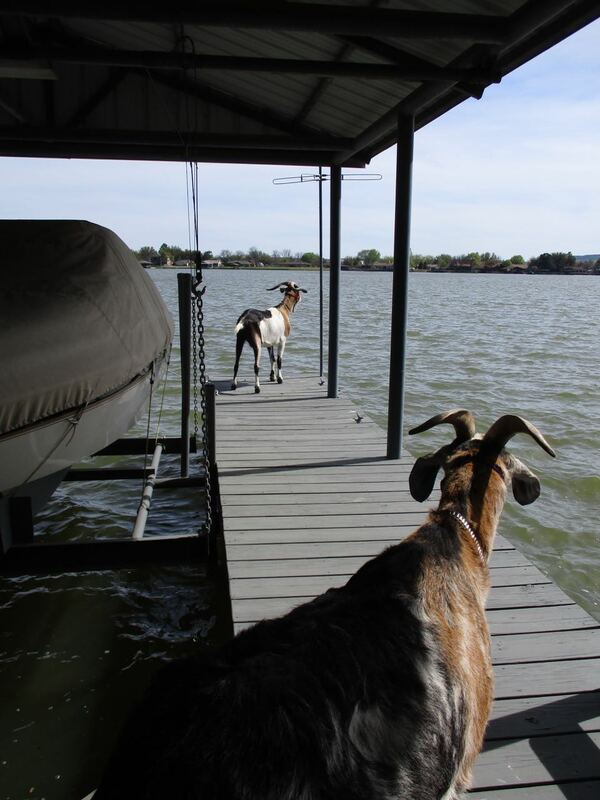 Goat vacations are usually reserved for summer (NAPgA Rendezvous) and fall. 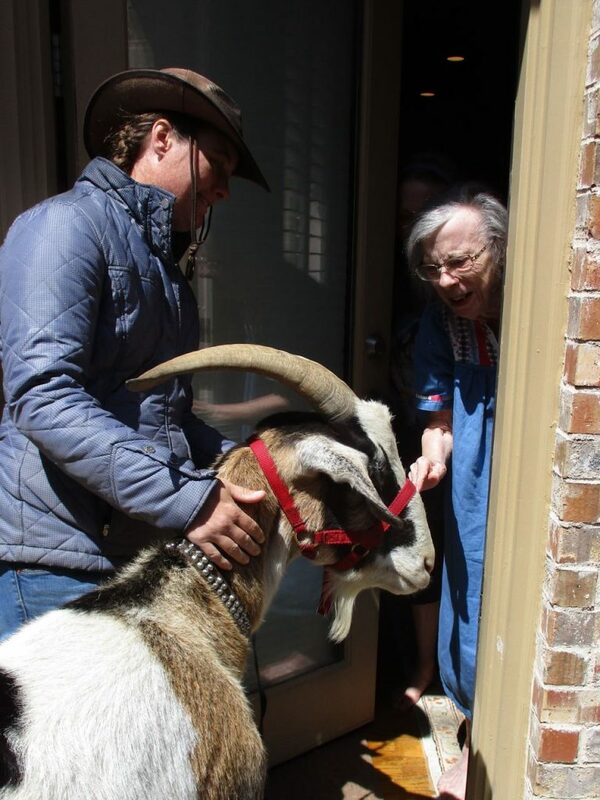 But this happened to be a good year to include goats on our spring trip. 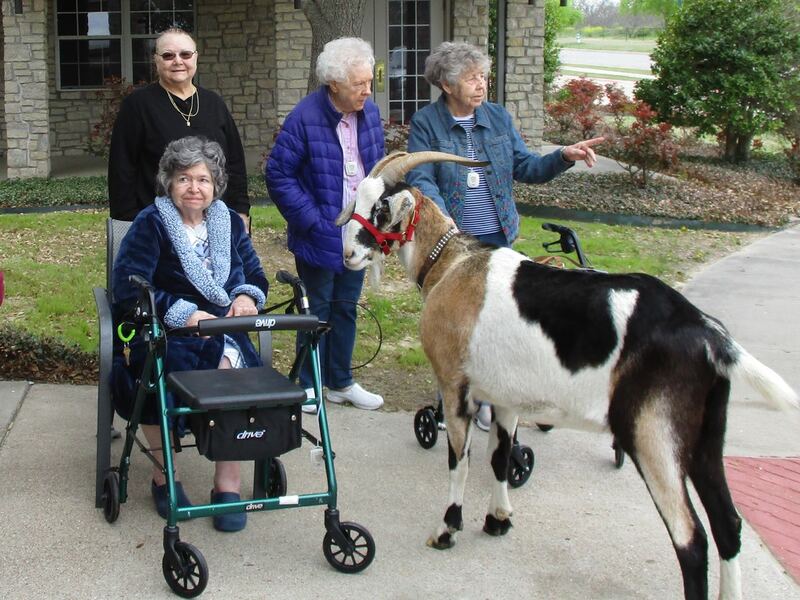 Most of my grandparents are in their 90’s now and can’t travel any more, so if I want to see them, and if they want to see the goats, we and the goats have to do the traveling. 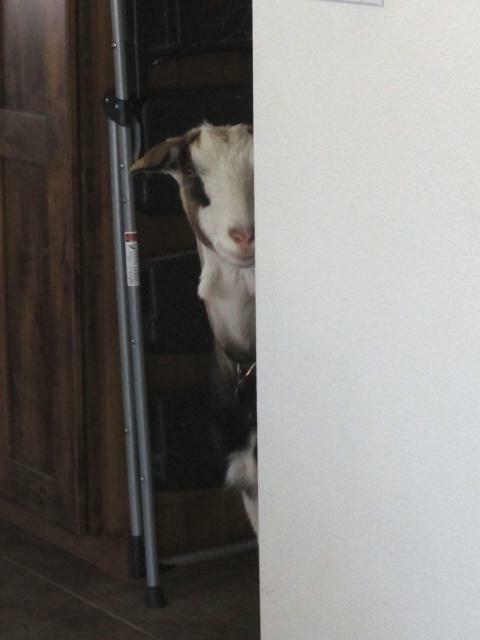 All of my grandparents are fascinated by our goats and ask about them any time we talk. 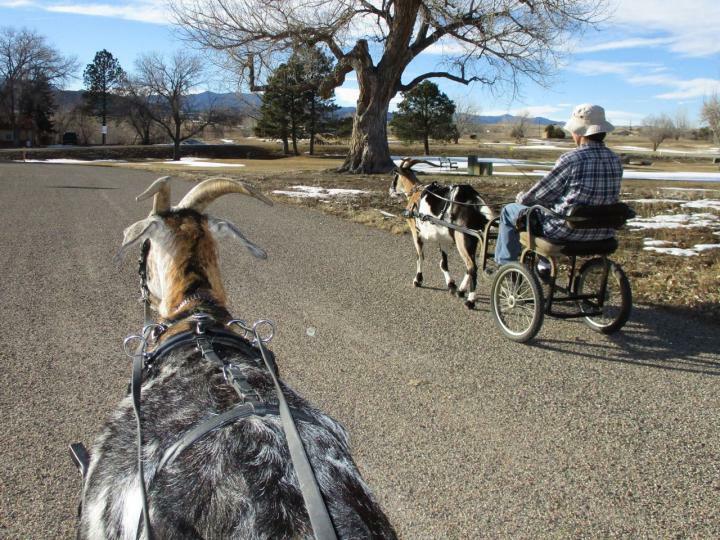 Some of them even rode Cuzco’s cart many years ago when we lived in Lake City. When I said I’d go down for a visit, all of them asked if I’d be bringing goats, so I said yes! 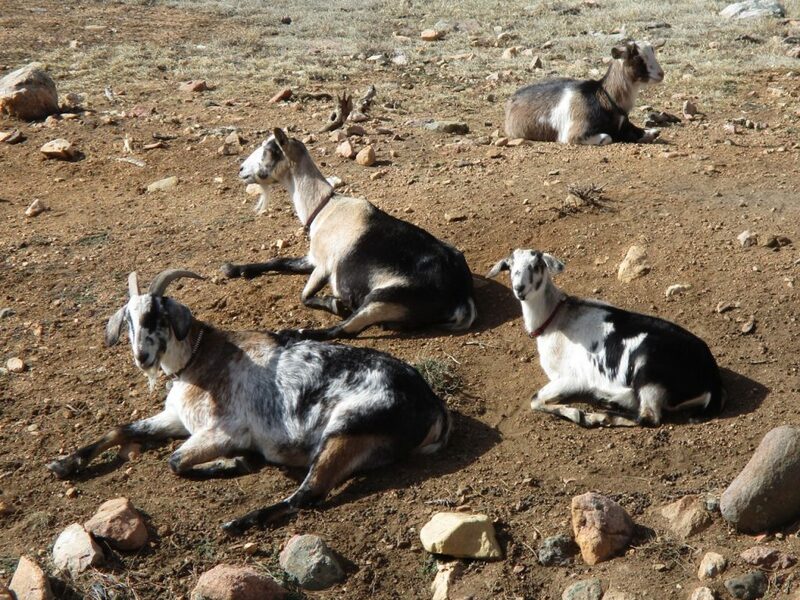 And since I was headed to Texas with goats, it only seemed natural to also call up some NAPgA members and organize a small packgoat get-together while we were there! 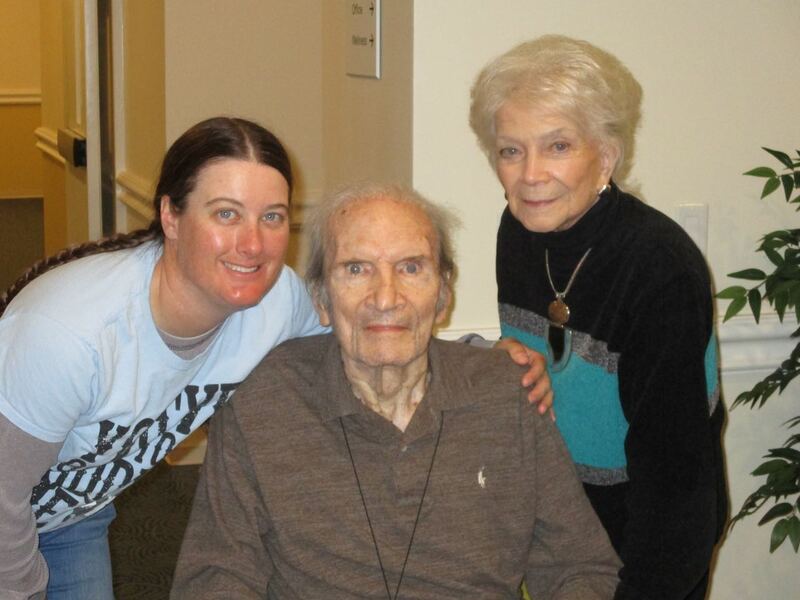 The fun times started on the last day of March when I visited my mother’s mother, who we call Bitty. “Poppy” is no longer with us, but Bitty still lives in her own house in the suburban McKinney sprawl and my aunt Laura lives with her and takes care of her. 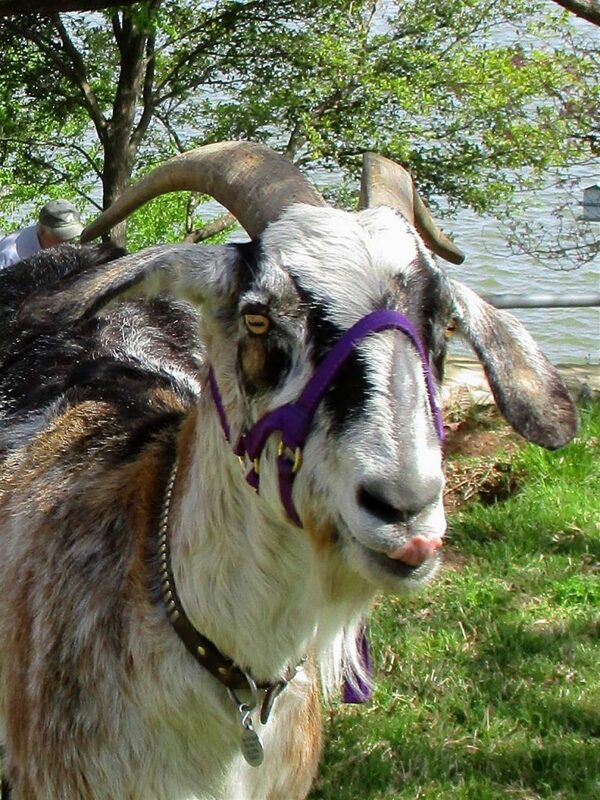 Bitty was thrilled when I told her we were bringing the goats. She had us put them in her little back yard so we could watch them through the window while we visited. Bitty spent some time petting Finn through the back door, but she couldn’t manage anything more because it was very cold and windy that day. 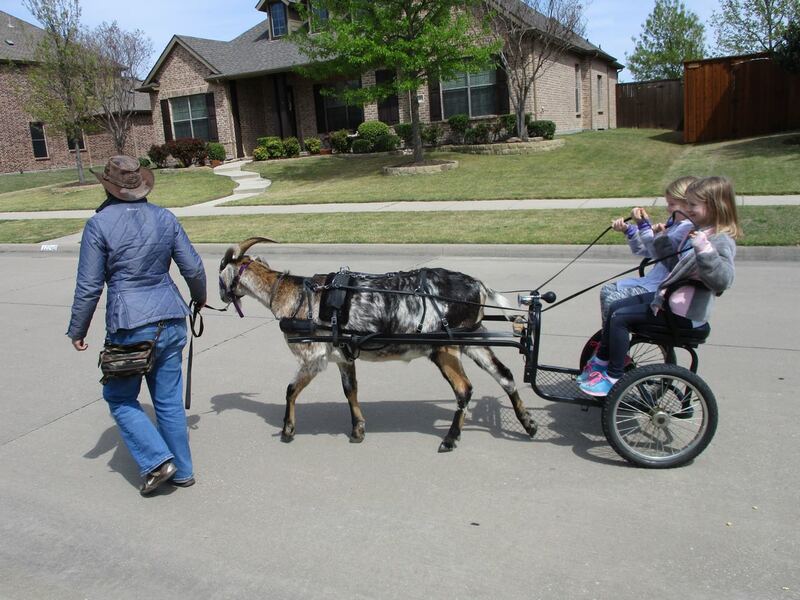 We had been hoping to take her for a goat cart ride, and if the weather had been nice I’m sure she would have loved to take a spin through the neighborhood! But alas, it was not meant to be! It’s a good thing Finn is gentle because he’s taller than Bitty! 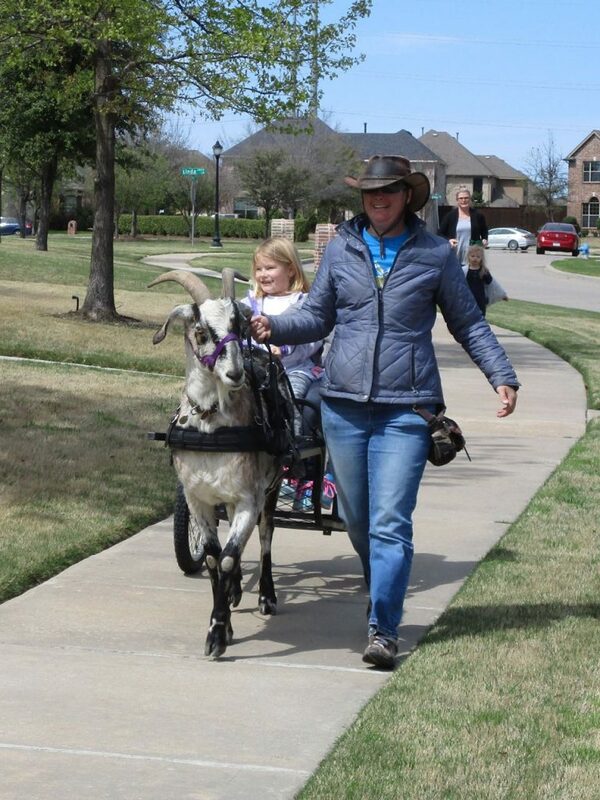 My aunt Marva and my cousin Erin live a few miles from Bitty in an almost identical-looking suburban neighborhood in Frisco. 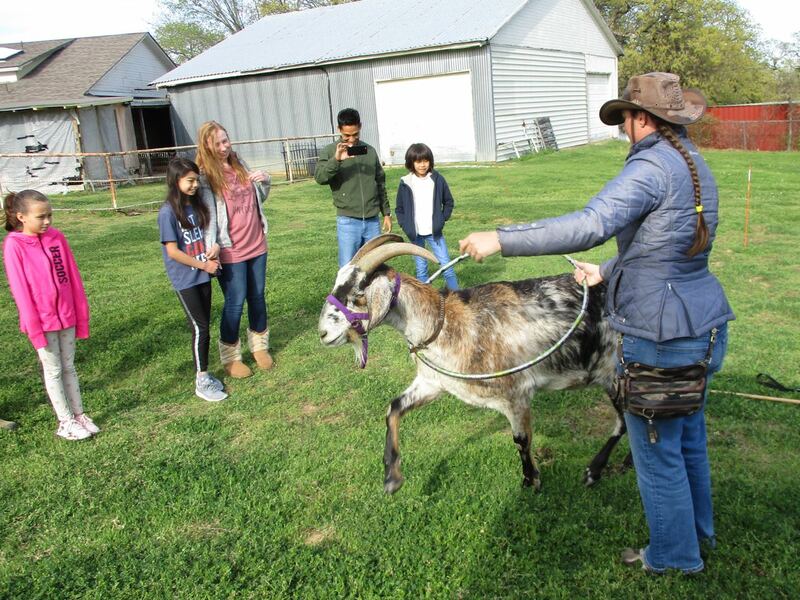 Miles and miles of countryside north of Dallas have been carpeted by McMansions laid out in over-planned neighborhoods with mazes of streets and houses that all look alike. 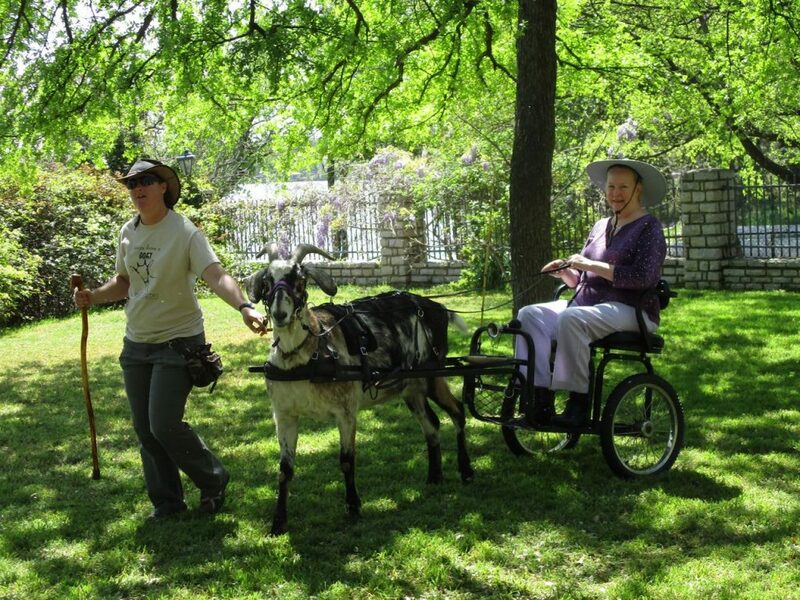 Goats are very out-of-place in these settings, but that’s one reason it’s fun to take them there and see the looks on people’s faces! 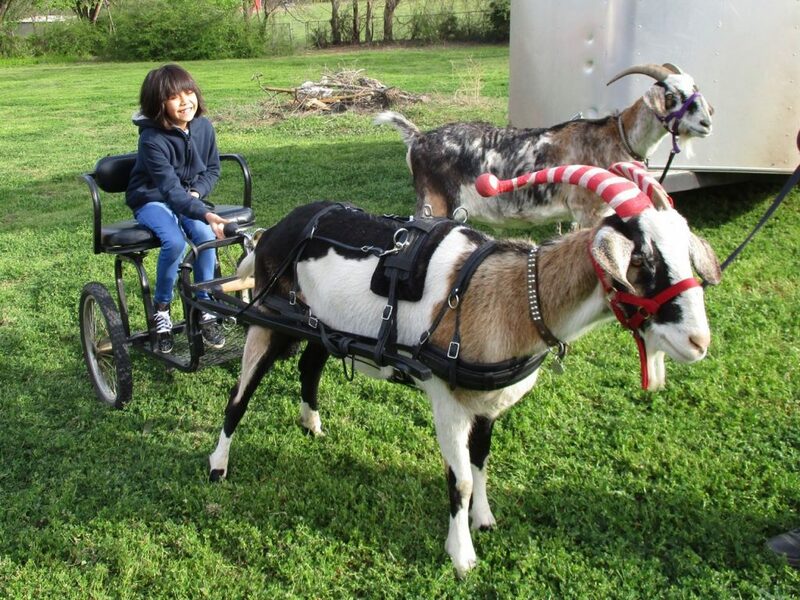 My cousin Erin has four kids and all of them were eager to see the goats! 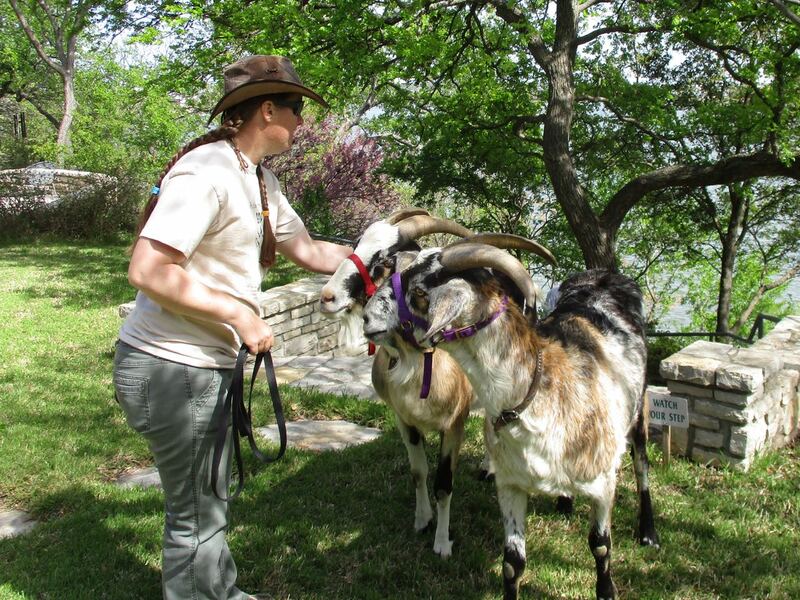 We started off with a little goat show, and Sputnik even shook hands with the older two girls, Kinsey and Hadley. 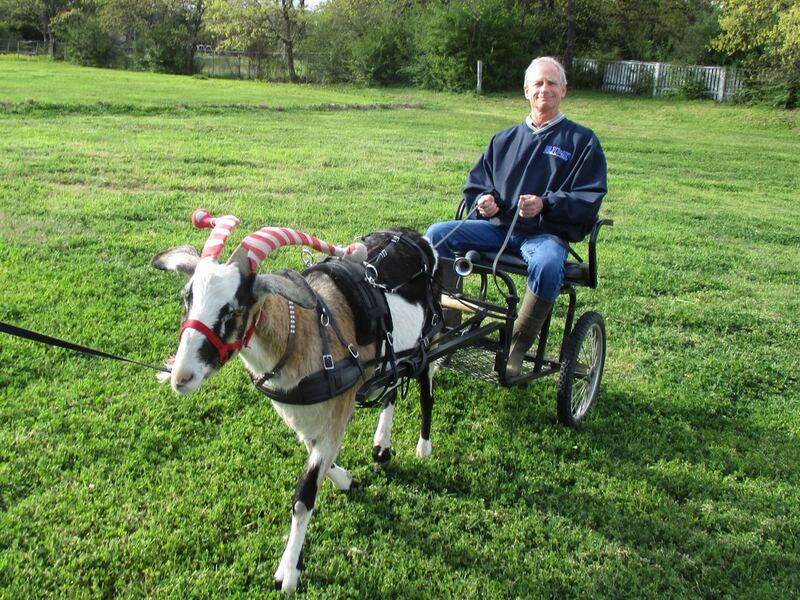 Then I hitched Sputnik to the cart and we gave them a ride. “WEEEEE!” It’s a good thing I always hook the reins to the harness instead of the halter because kids sure love to haul away! I think everyone is grinning in this picture–even Sputnik! 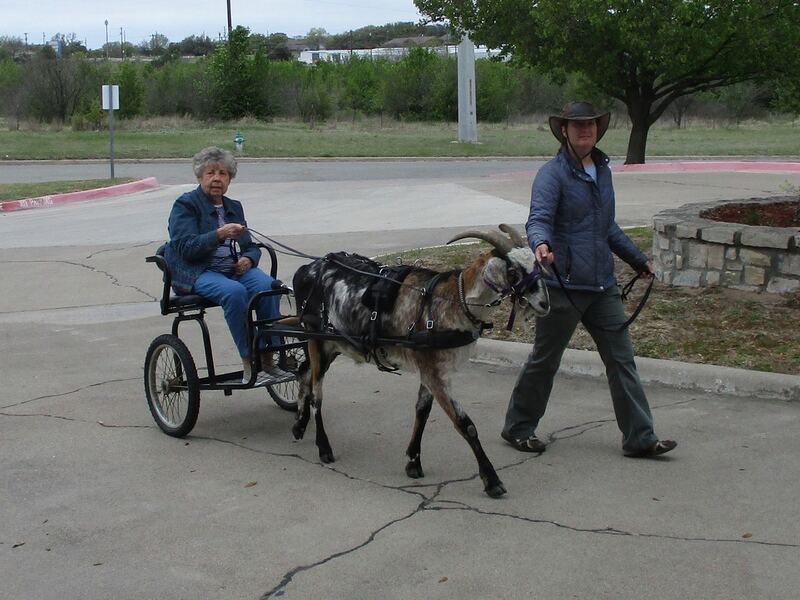 My aunt Marva rode with the youngest, Becket. 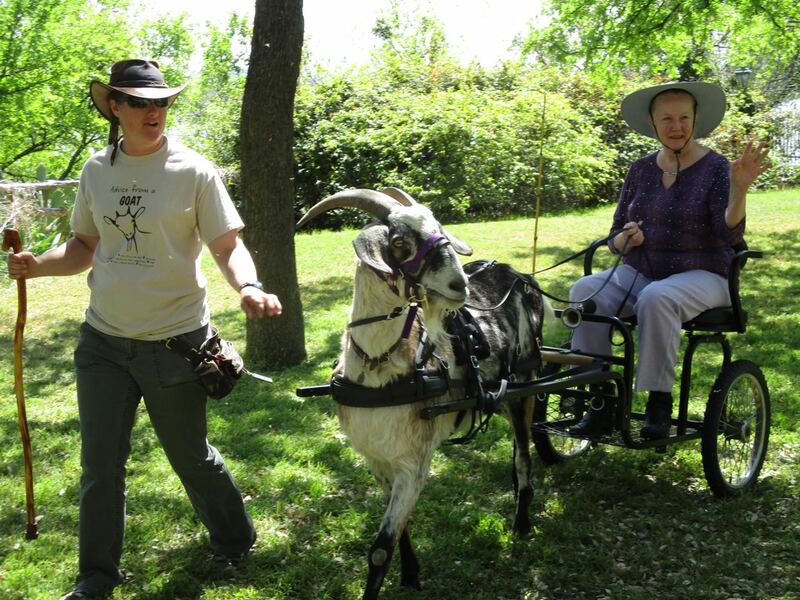 He didn’t seem overly impressed by the goats or the cart and he did not volunteer for a second ride, but Marva sure had a lot of fun! 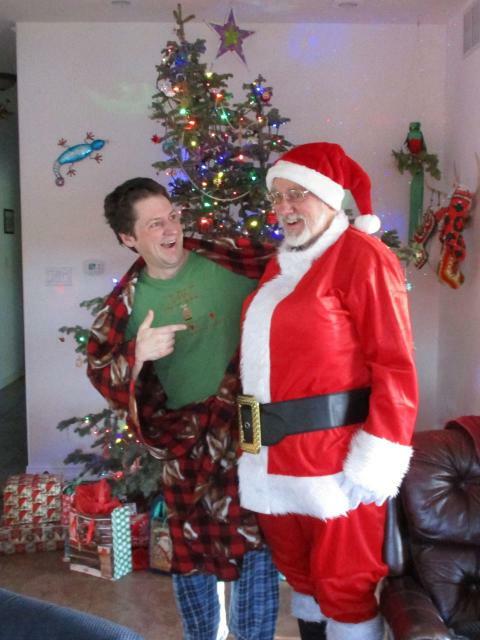 Next day Phil and I visited Billie and Dan (my dad’s mother and stepfather) who live in downtown Dallas. 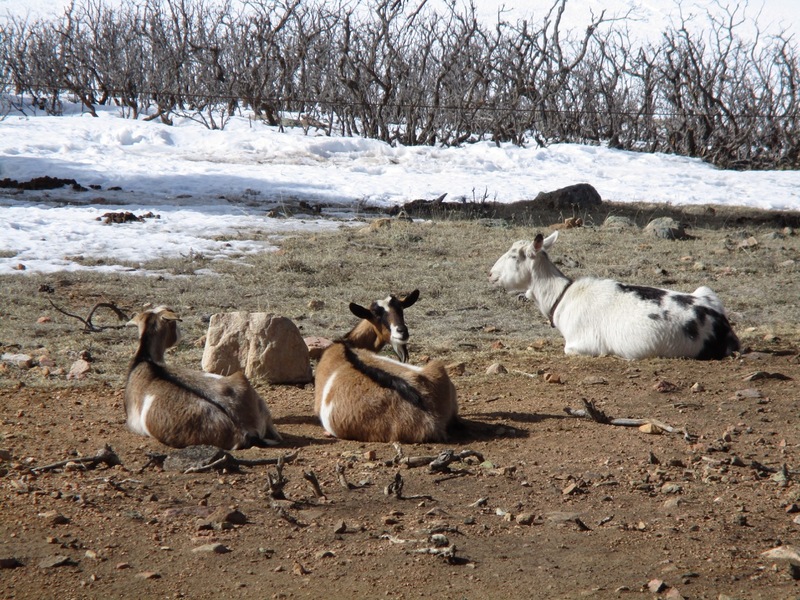 They were really looking forward to seeing the goats, and we originally planned for all of us to go to the park and take a cart ride, but the weather remained cold and miserable so we had to leave the goats behind so we could all stay indoors. However, Phil made up for it by playing just about every fiddle tune he ever knew. Several other folks from the residence came out and enjoyed the music with us as well. It was a toe-tapping, hand-clapping good time! It’s been a while since I’ve posted, but then again, there hasn’t been a ton of activity around here lately. The piles of January snow melted into mud, and just as the grass started poking through and things began to dry out near the end of February, we got more snow! We’ve been very fortunate to have so much moisture this winter. I’ve been trying to keep up with the firewood. Snow came so early this year that I wasn’t prepared, so I’ve been having to cut wood through the winter as weather and ground conditions allow. 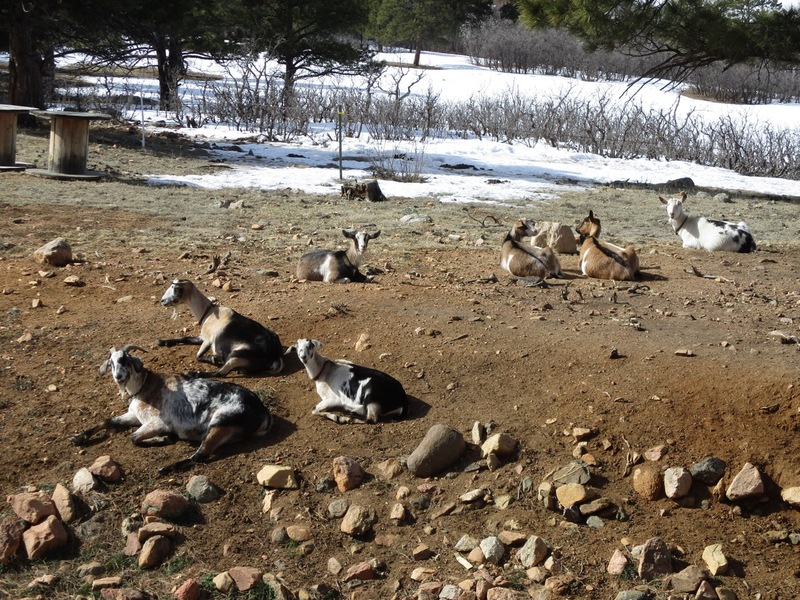 The goats enjoyed a little sunshine and dry ground in mid-February. I love how family groups stay together. Petunia, Sputnik, and Skeeter are always hanging out in a friendly little group. Sadie doesn’t have a family group, so she floats around from one friend to another. She goes back and forth between the herd social butterfly and the herd outcast. The snow came back near the end of February. The sun came up like a pillar of fire and then vanished behind a heavy cloud bank. 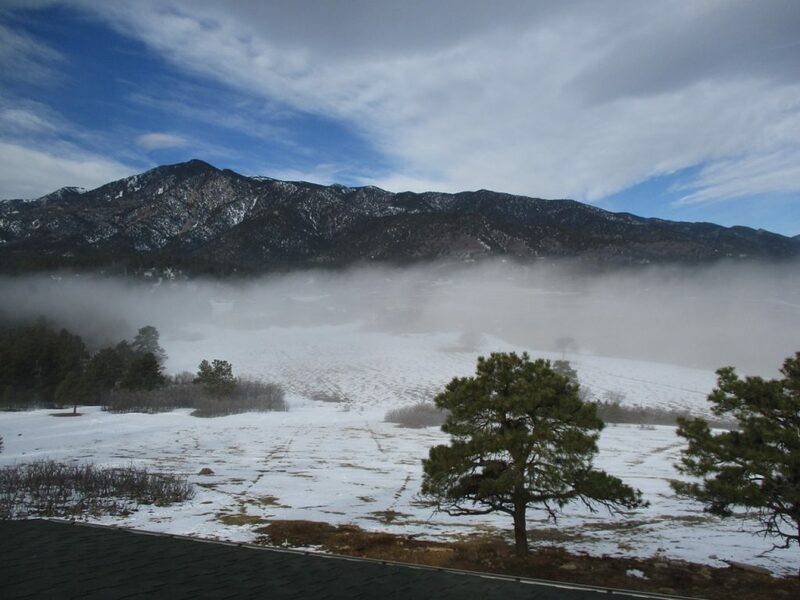 The fog monster descends… It was funny because the morning was filled with bright sunshine before the cloud bank rolled down the valley. Within a few short minutes, our house was engulfed and we couldn’t even see the trees in the foreground. 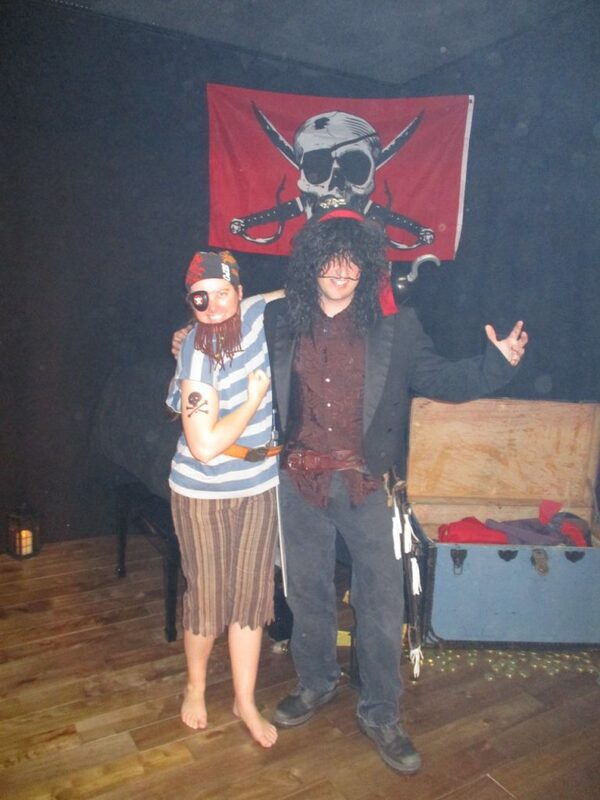 On March 2nd, Phil and I participated in a play called, “Pirates, the Musical.” Believe it or not, Phil was the “King of the High C’s,” a famous pirate vocalist and the star of the show. I was but a lowly swab. It’s been pretty cold the last few days. 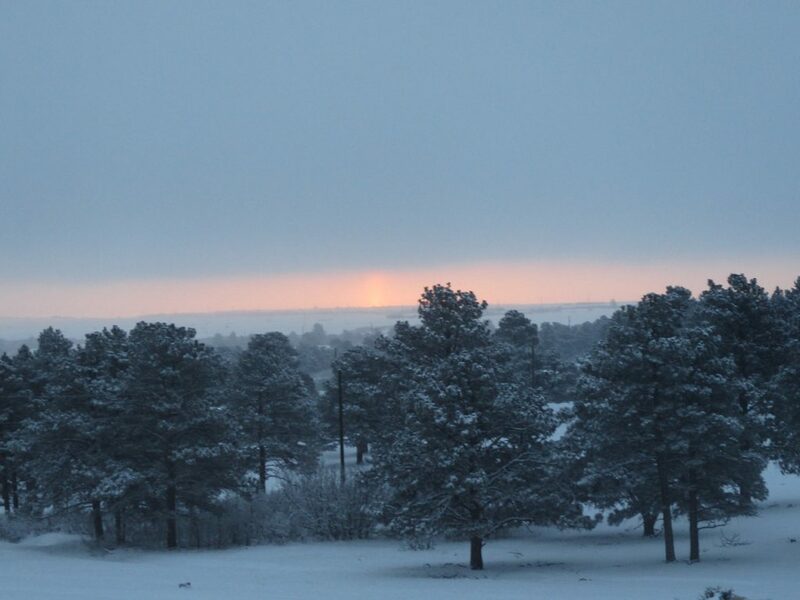 We were treated to a beautiful sunrise yesterday morning. All the trees were covered in a thick layer of hoarfrost. 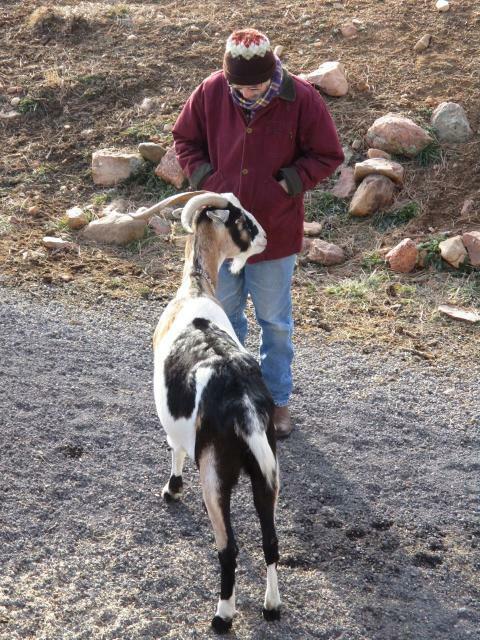 Yesterday was so cold I didn’t let the goats out of their pen, but little Coral (who we affectionately call “Fuzzy”) still had to come to the house to get milked. It’s a long way back to her pen and didn’t want to make her wait for me out in the cold by herself while I strained milk. 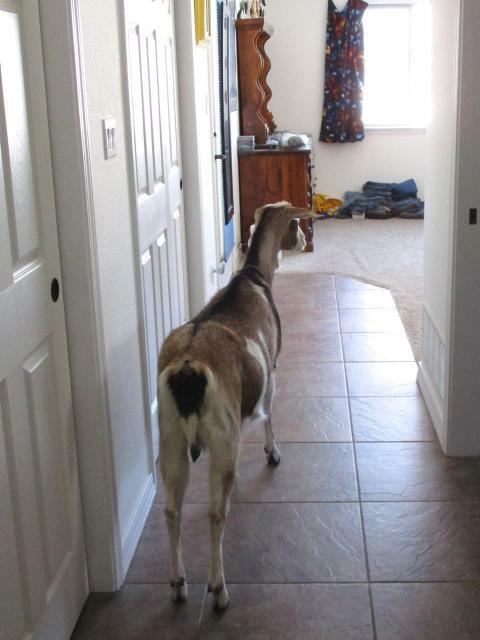 So I let her follow me upstairs to the kitchen while I put the milk away. 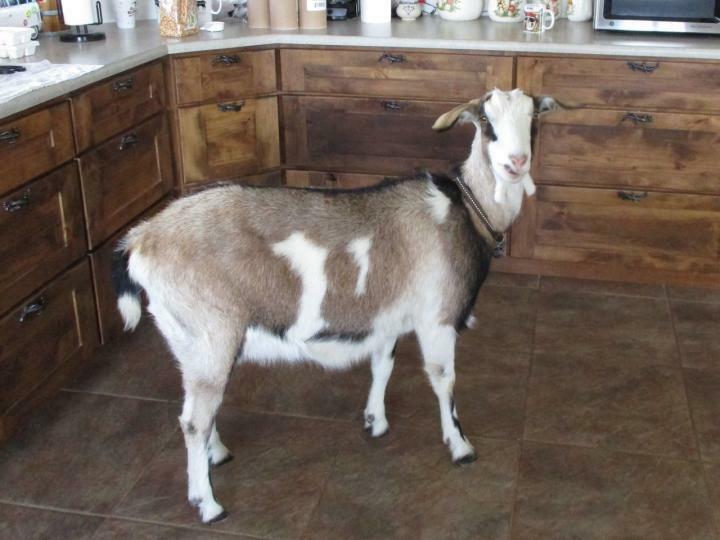 She’s a sweet, timid little goat and she doesn’t get into things when she’s in the house. 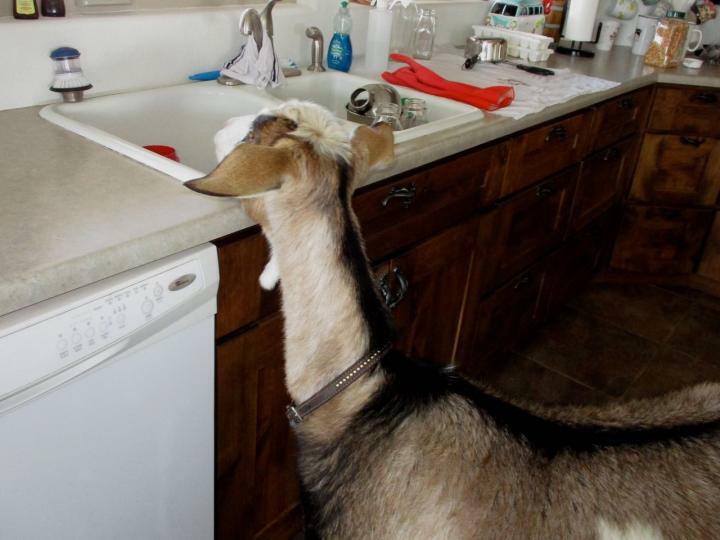 Most of my goats would behave like a tornado, but Fuzzy just tiptoes around and carefully sniffs things but doesn’t mess with them. 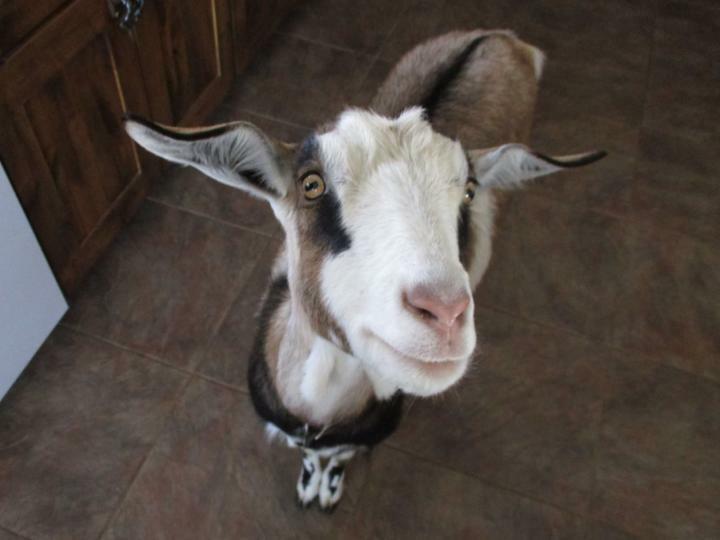 She’s completely adorable and if I were to choose one for a house goat, she would be it. Off to explore the rest of the house! 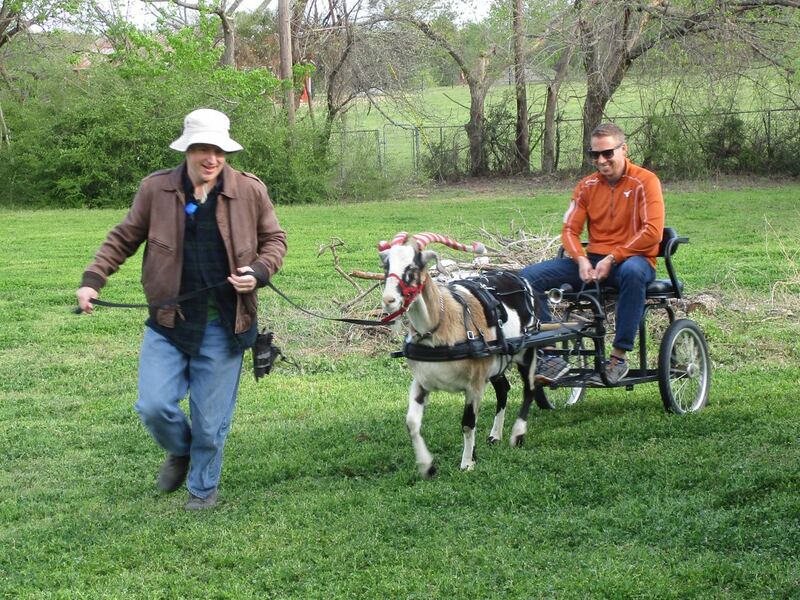 Don’t be jealous–Phil and I drove goats today! Finn and Sputnik haven’t been driven since Christmas time, and they haven’t pulled their single carts since sometime last summer I think. They did awesome and we even staged a couple of short races down the straightaway. I could tell that all the people driving by on the highway were green with envy. 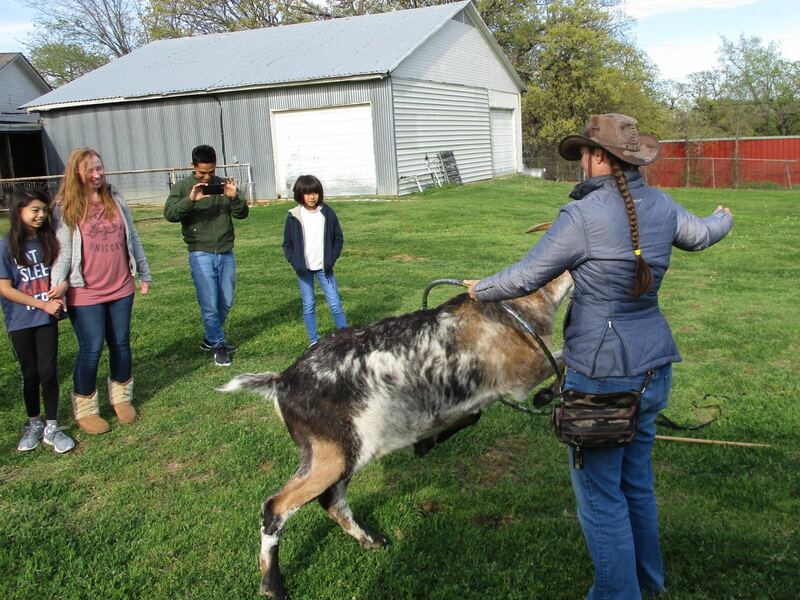 After we drove goats, I stopped to pick up something at the saddle club. It was muddy down there. VERY muddy. I started down the hill toward the arena on foot because I knew the truck would get stuck if I drove to the gate. About the time I was beginning to think maybe this was a bad idea, and perhaps I should fetch the item another day, my foot slipped and down I went, KERSPLATT! into liquid clay. Phil had a beautiful view of my acrobatic display from the warm, dry cab of the pickup truck. I decided I might as well walk the rest of the way to the arena because I couldn’t possibly get any muddier at that point. I was far too muddy to sit inside the truck. 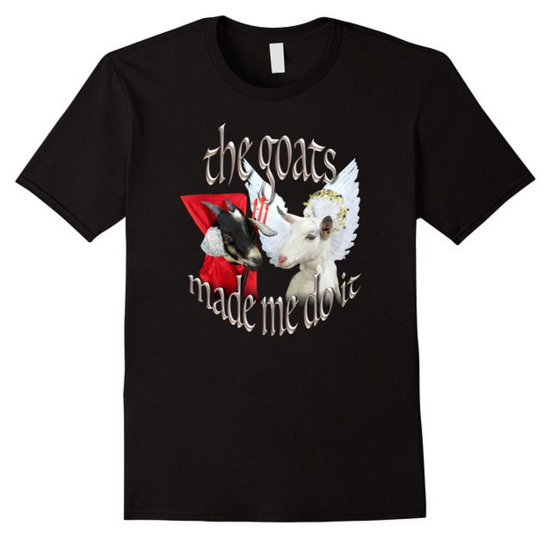 I had to ride in the bed with the goats. Luckily the thing I had picked up from the arena was a mounting block and it made a good seat. Once home, I stripped down outside and tossed my clothes over a plow blade so I could hose off the chunks of congealing mud. What a great day! 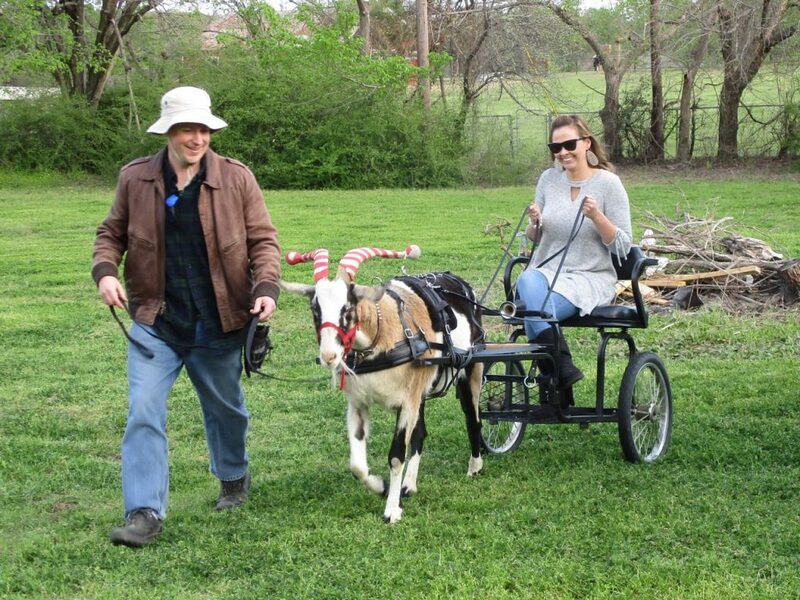 We had a fabulous time goat carting, and we ended it with a hilarious new episode of “Disaster Wife” (one of me and Phil’s inside jokes). As I look back on 2018, I see a year of contrasts: Joy and Sorrow; Gain and Loss; Triumph and Tragedy. 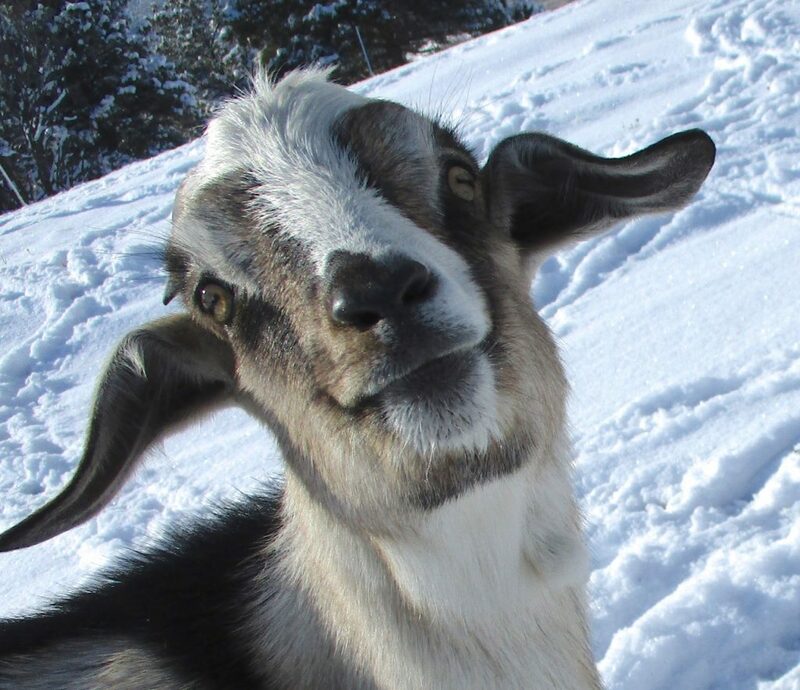 We started the kidding season early with Skeeter and Blackbird arriving February 1st and providing endless entertainment on long winter nights as we practically turned them into house goats. 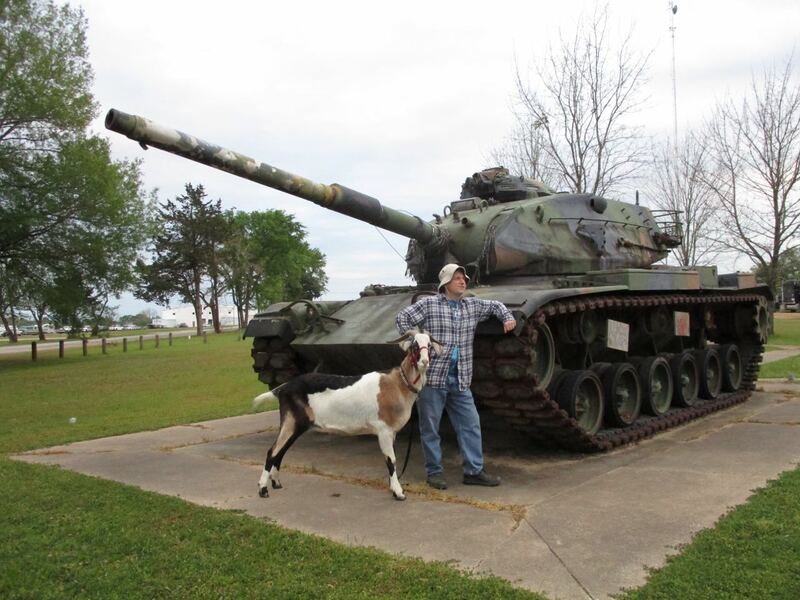 We’ve had a lot of fun baby goats over the years, but those two were in a league of their own! 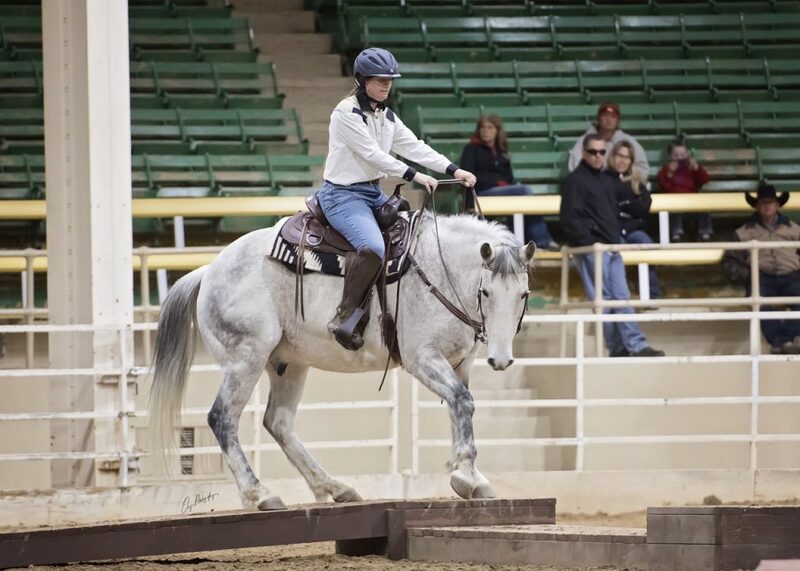 In March I took my horse Jet to Denver for an obstacle competition at the Rocky Mountain Horse Expo. 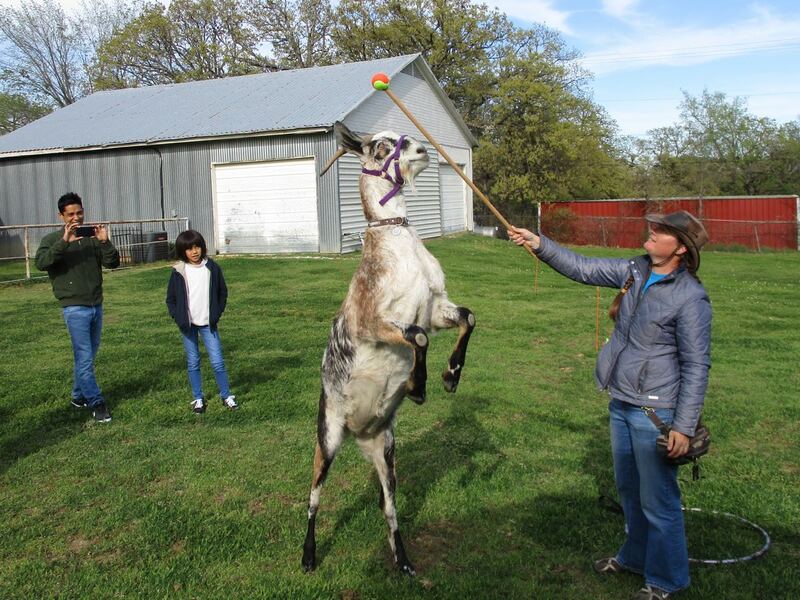 We didn’t win, but we had a blast and Jet got to be the star of a clicker training clinic. He hammed it up and won the hearts of both the trainer and the audience. We returned home in high spirits, only to be met by the news that Tigerlily was miscarrying a month before her due date. 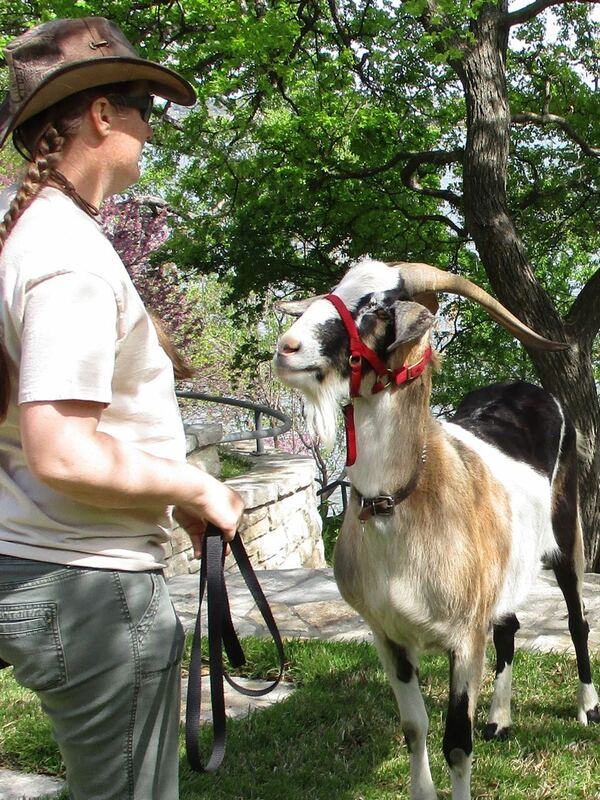 There would be one less sweet baby to greet at Goat-O-Rama. 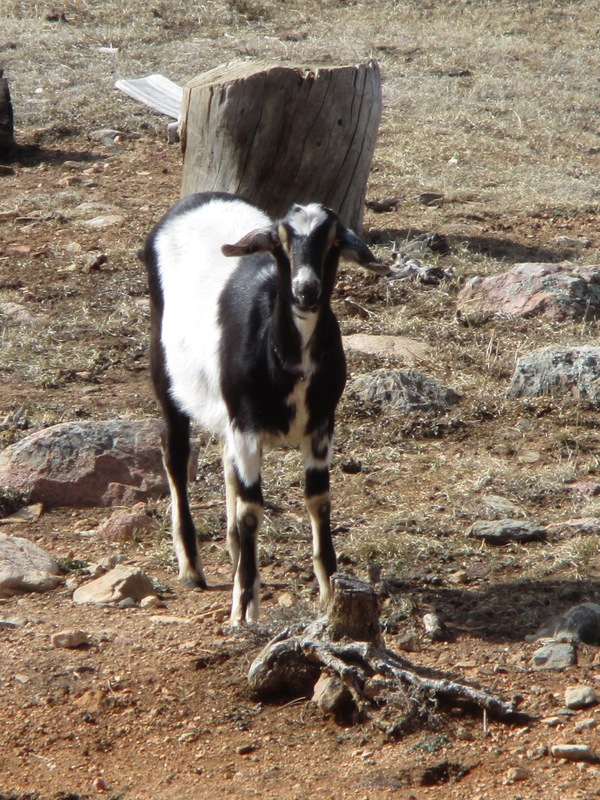 He was black with a white belt, beautiful white markings on his face, and speckled ears. We had no winter. Aside from a single frigid night so cold it burst a water line, the weather stayed warm and barely any snow came. A few feeble shoots of pale grass poked up timidly in April and were met by hot winds. They were scorched brown and dead by May. The ground stayed hard and bare. On June 1st I hosted a state-wide horse show at our saddle club and the rain poured down so hard we had to cancel the show halfway through. It was the only day of moisture in a four-month span that stretched from mid-March to late July. Heavy as it was, our single day of rain was not enough to relieve the drought. Within hours, the parched ground had swallowed all the water and there was no relief. One consolation was that it was too dry even for the insects. There were no grasshoppers, flies, or mosquitoes. The sky was brassy and trees began to die. I stopped turning on our electric fences, afraid they might cause a spark in the hot wind. We were grateful for the scrub oak. Grass for the horses was able to grow in the shade beneath it, and the oak leaves provided forage for the goats. Most of my friends were having to feed hay. 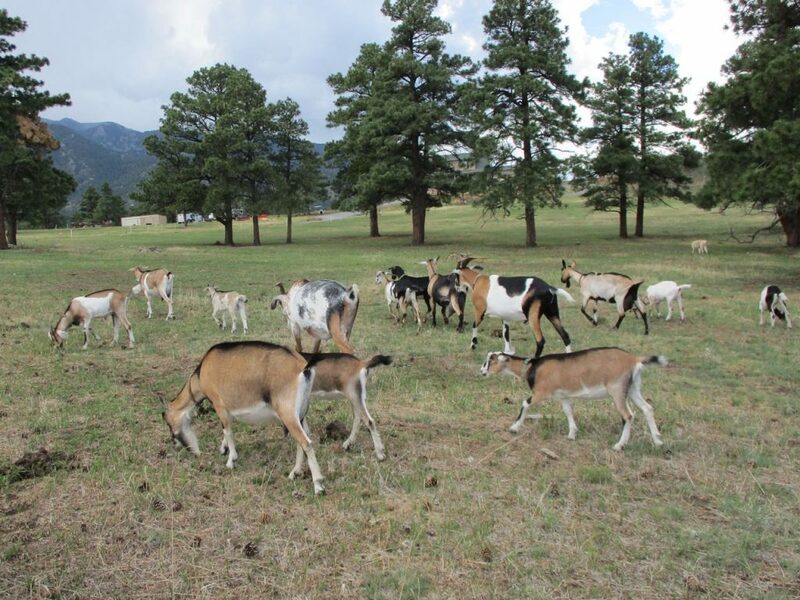 In June Phil and I drove to Idaho with Finn and Sputnik for the North American Packgoat Association Rendezvous. It was a wonderful time to catch up with old friends and meet new ones. It’s aways fun to see people in person who you mostly hang out with online. Pounding rain and hail almost flooded out our camp the first day and night, and the weather stayed cold and the sky gloomy all weekend, but it didn’t dampen our spirits. Phil and I had almost forgotten what soggy ground looked like! I was glad I remembered my rubber boots. A few days after we got home, Phil and I took a walk at night to avoid the relentless heat of the day. I smelled smoke and the moon looked eerie and unnatural. There was a faint but suspicious glow over the southwest shoulder of our mountain range. It was the start of the Spring Creek Wildfire, which ballooned in size over the next few days as hot winds drove it through forests that had become dry tinder. The brassy sky rained ash on a parched earth, and the horrifying thought of being unable to get back home to evacuate our animals kept us from going far. One or two fires did break out closer to home, but thankfully they were put out quickly. After something like ten months of drought, we thought we might never see moisture again, but around July 20th the rains began to fall–in buckets! Within two days, a sparkling emerald sheen began to creep over the crinkly brown fields. The patient, hardy mountain grass had been waiting just off the wings to come bursting on-stage at the first opportunity. I walked over brown mud in the early afternoon and a few hours later I walked again over the same ground, now covered with little green loops pushing through the damp soil. By next morning they had popped their spiky heads up. 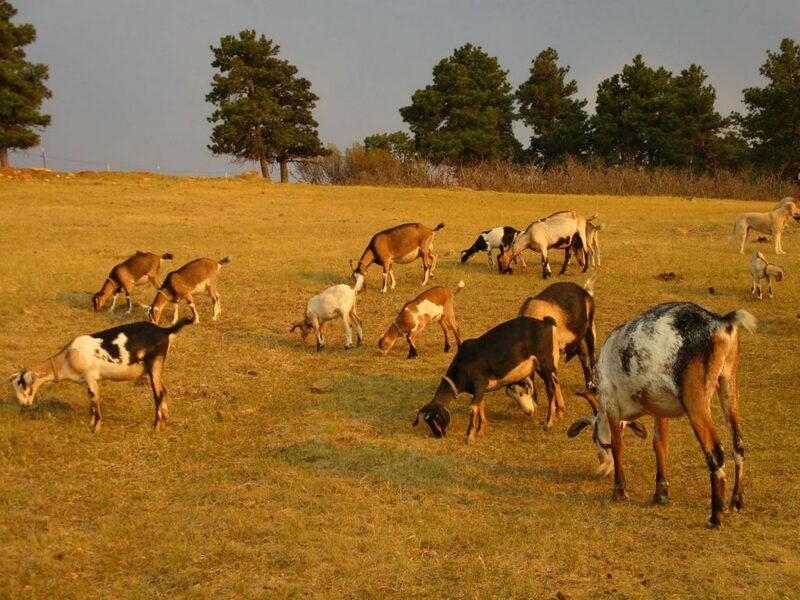 Within a few short days they were several inches tall and the pastures took on a softer look. But the blessed rain brought unexpected loss. 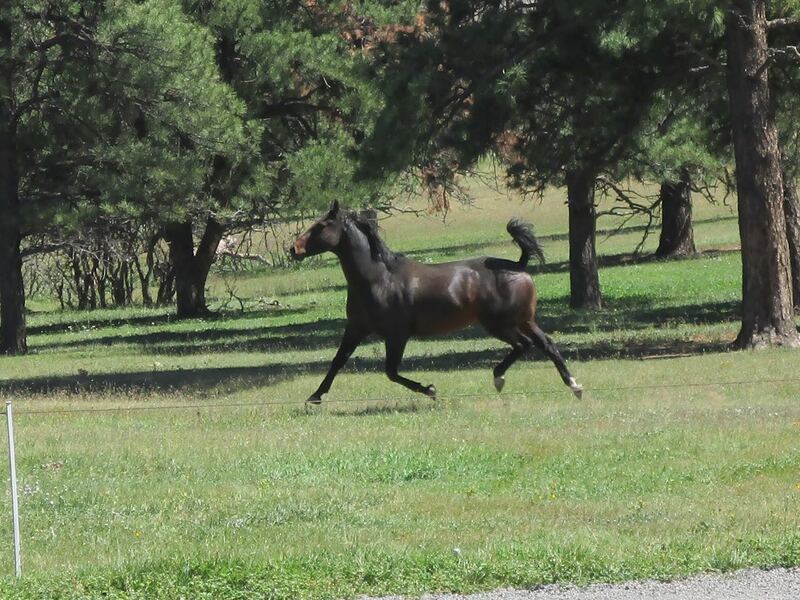 On July 25, Jet and I came home from a triumphant night at Salida’s Chaffee County Fair where we claimed the Gambler’s Choice Obstacle Challenge jackpot. Next day we were hit by a blinding thunderstorm and Jet was gone in an instant when a bolt of lightning struck his tree. 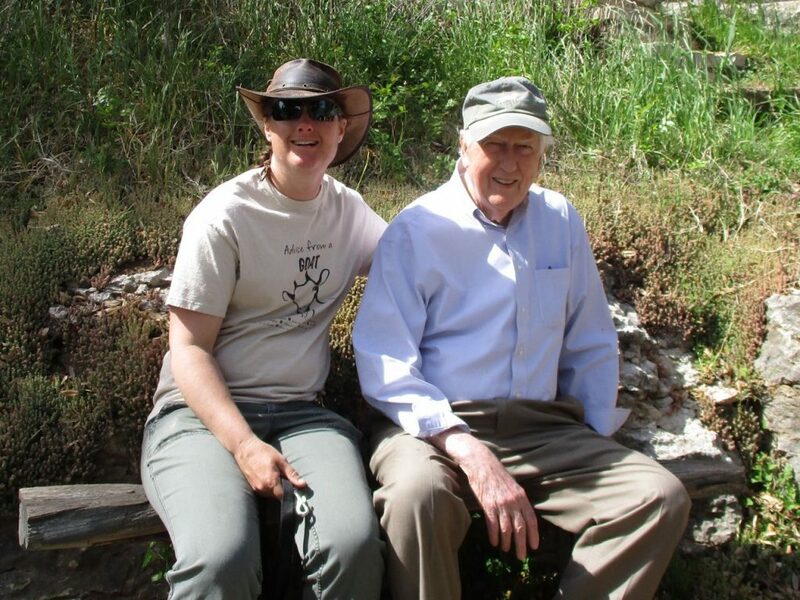 He is buried beneath it and Phil and I commemorate him by placing a rock on his grave each day when we go for our walk. 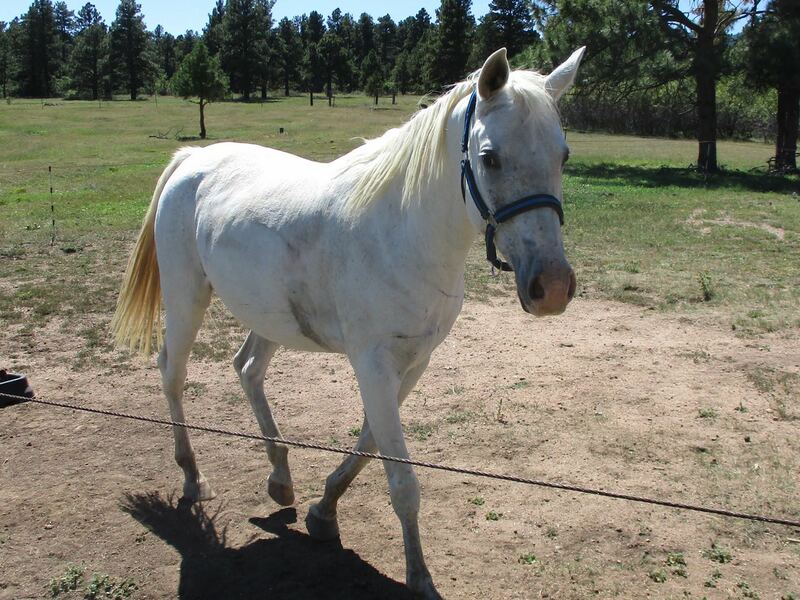 He was the last in a line of horses that has been with me since I was three years old. His great grandmother April gave birth to Tuffy when I was almost four, and Tuffy gave birth to Easter a few days after my tenth birthday. 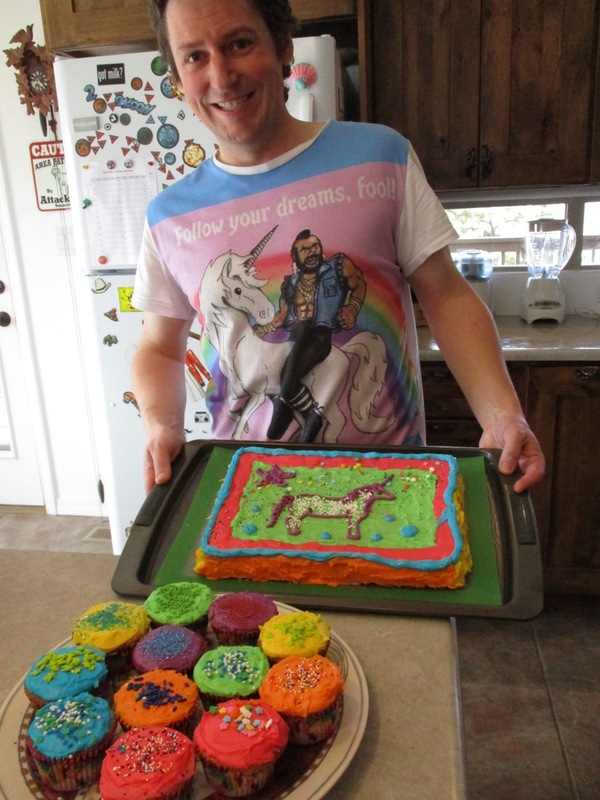 Easter was my first “very own” horse. Jet was Easter’s only foal and I may dedicate many of this year’s blog posts to him as he was a magnificent and multi-talented horse. My inability to say goodbye made his death harder than any previous loss. 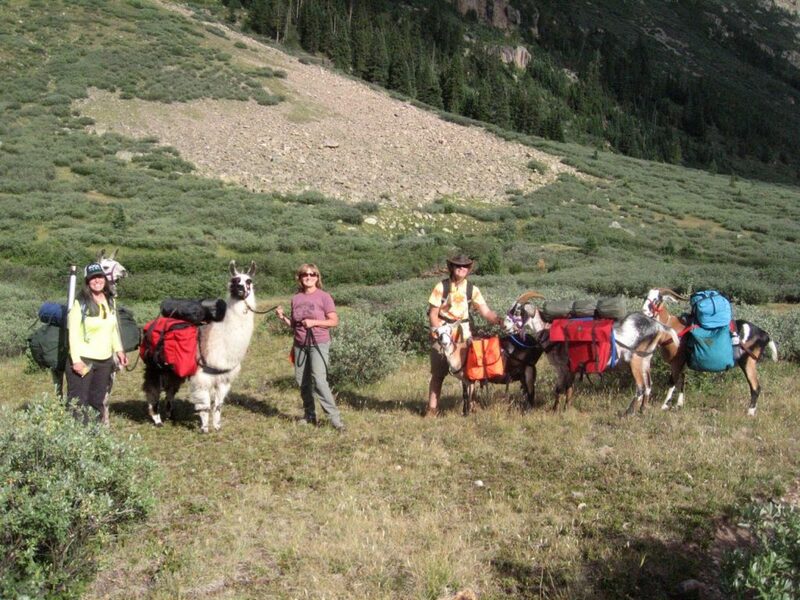 I was grateful to have planned a 4-day backpacking trip with a couple of other ladies that started only a few days after Jet died. It cut short my grieving but it also gave me something totally new to think about. It was a wonderful trip and my packgoats proved themselves mightily, especially when contrasted with the fussy, high maintenance llamas that also came along. August, September, and October are a blur. After the backpacking trip my family and Phil’s vacationed on a houseboat at Lake Powell. We drove Finn and Sputnik in the Colorado State Fair parade. 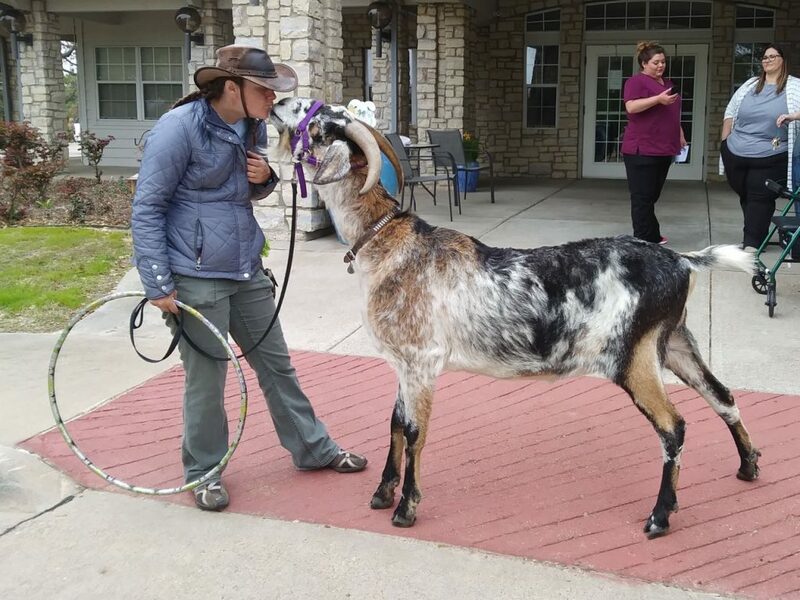 I sold a few baby goats and said goodbye to Nauti who was not thriving here. She went back to her original owner. 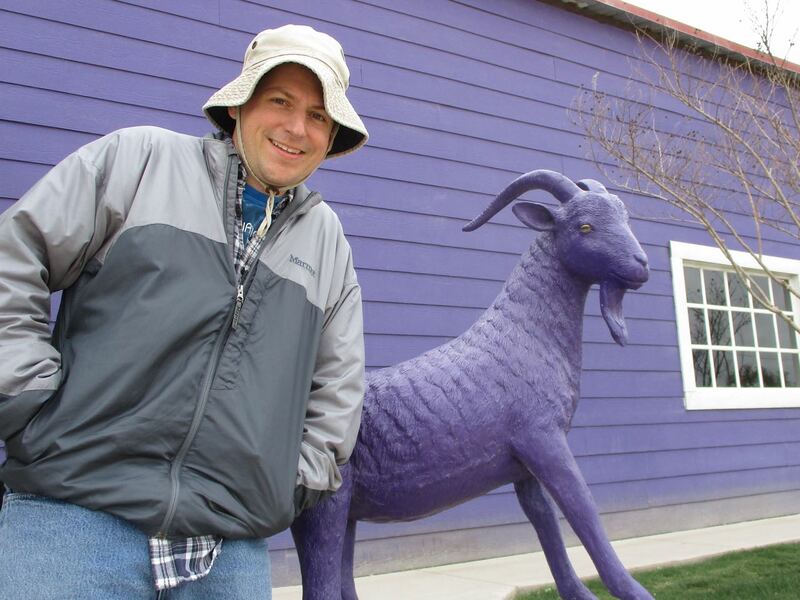 Phil and I took our annual “goat vacation” in Taos in early October. I spent most of those months feeling depressed and it’s hard to remember all the fun things we did. I knew I needed another horse. 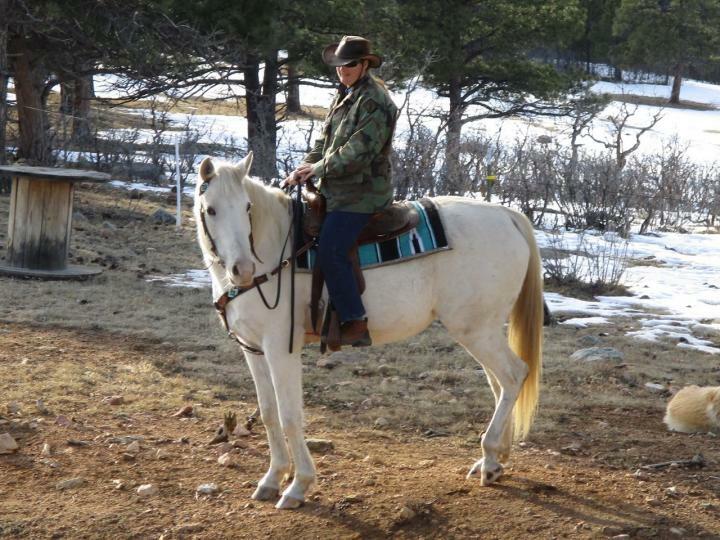 Skokie was lonesome and desperately needed a buddy, and I needed another horse to help me move on as well. 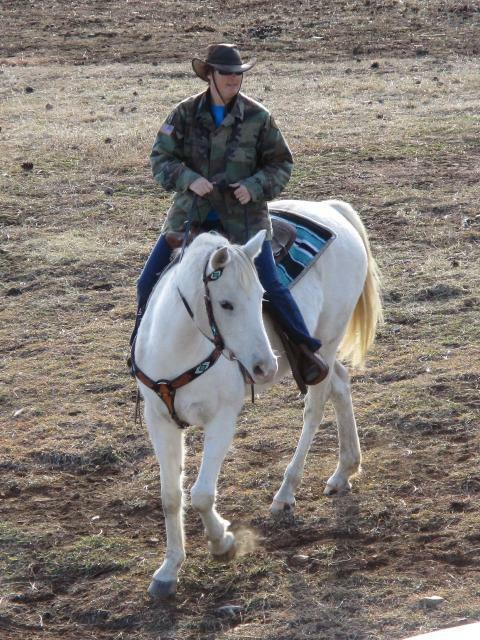 In September a friend of mine offered up a horse I had been watching her daughter ride at Saddle Club all year. 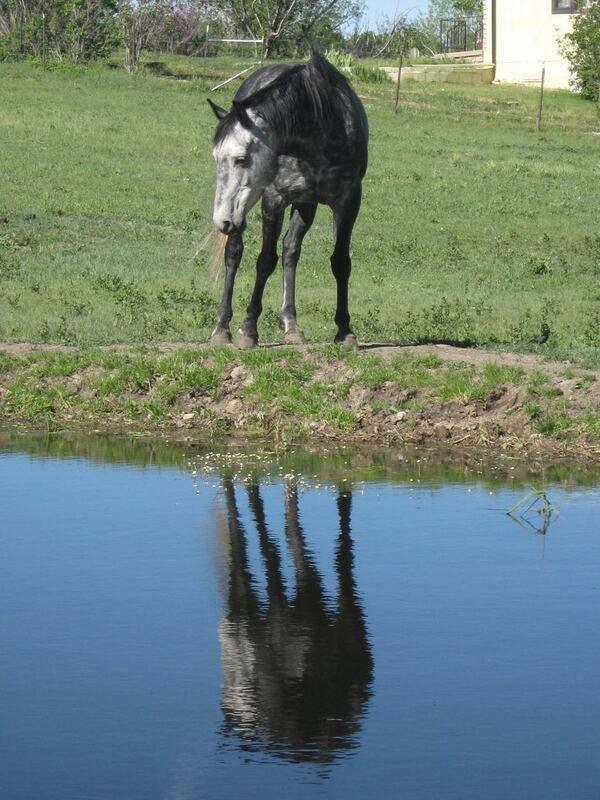 I had admired the horse, and when she came up for sale I gave her a try. She seemed very nice, my saddles both fit her, and the price was perfect. I brought her home September 15th and changed her name to Stardust. I call her “Dusty” because white horses never look clean. 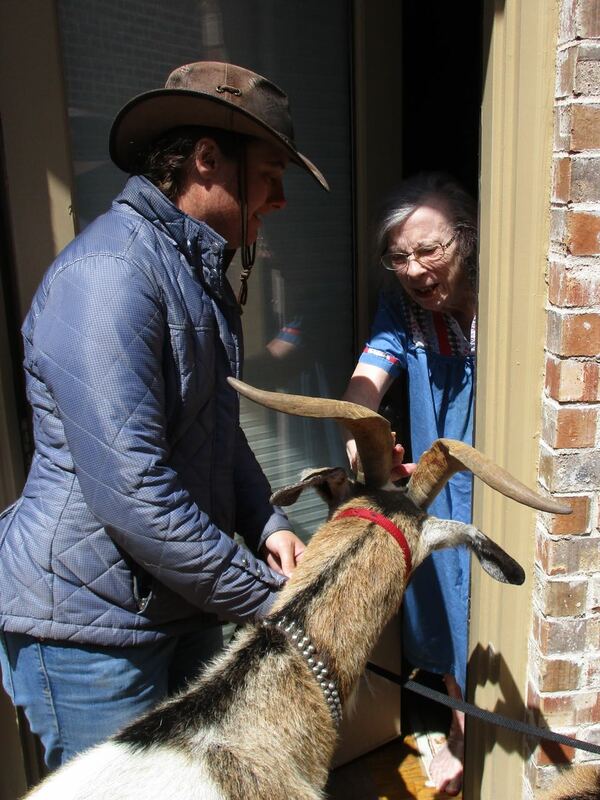 Skokie was overjoyed when this beautiful white creature stepped out of the trailer. Winter started the day before Halloween. We got our first big 15″ snow on October 30. We had more snow in that one storm than we had during the entire previous winter! And it didn’t stop there. Several more large storms hit us in November and December with smaller ones scattered in between. We’ve hardly seen the ground. As soon as it melts off, another storm covers it again. 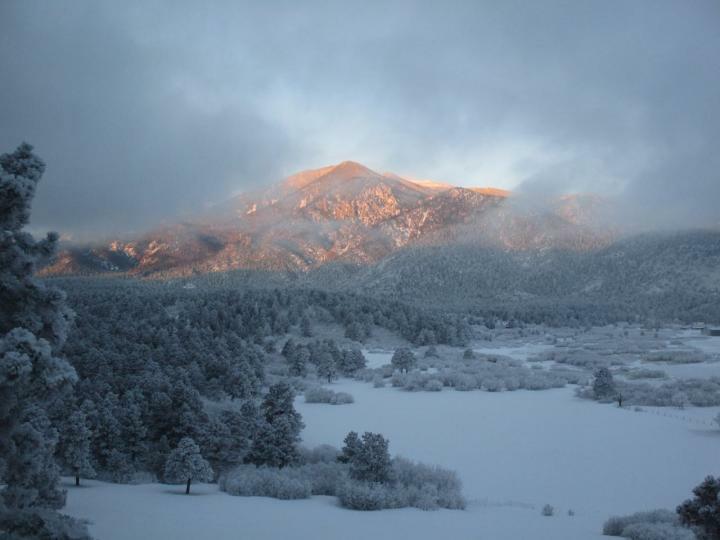 It’s a proper winter the way Colorado winters should be.